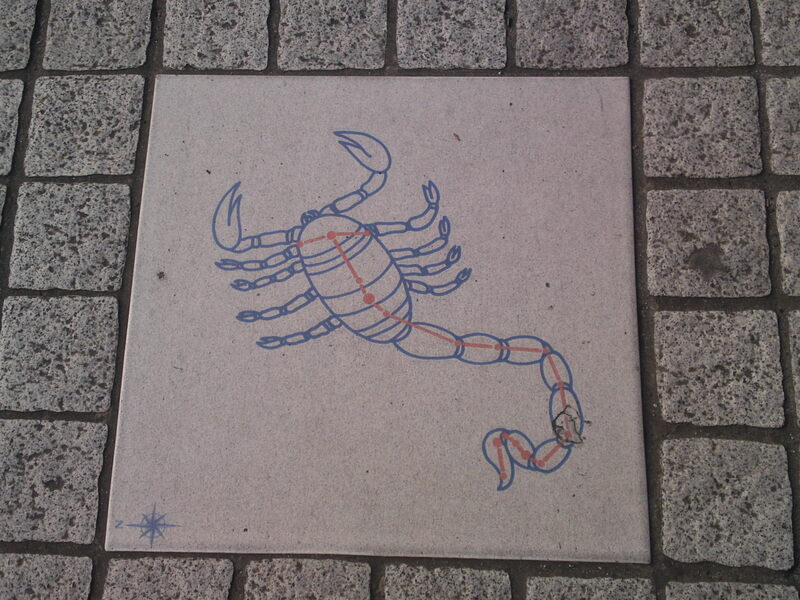 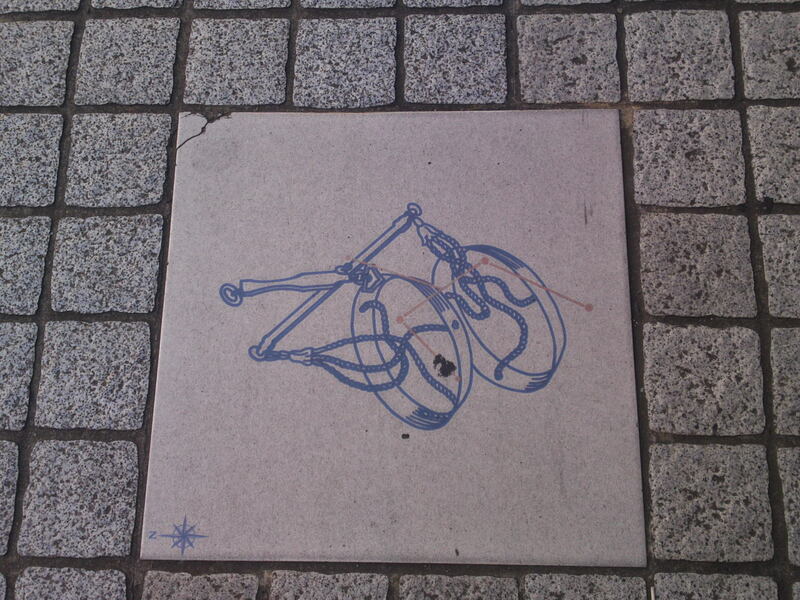 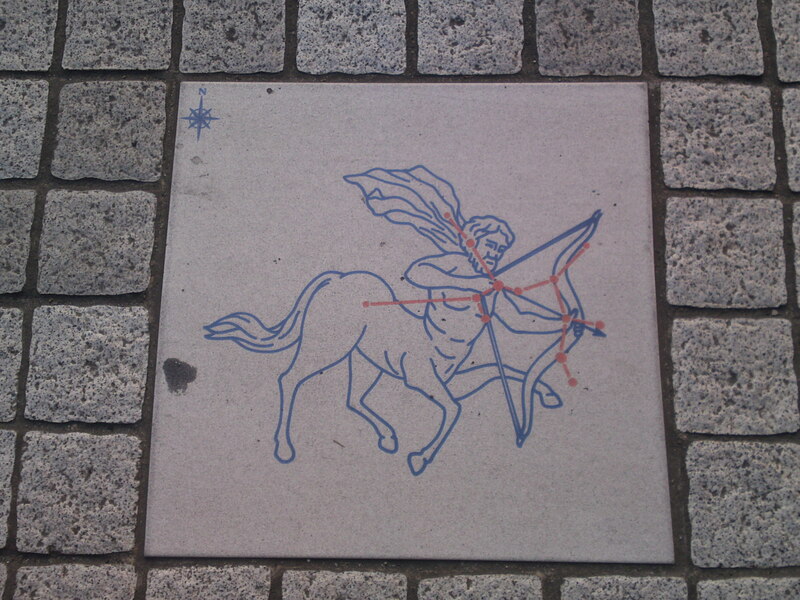 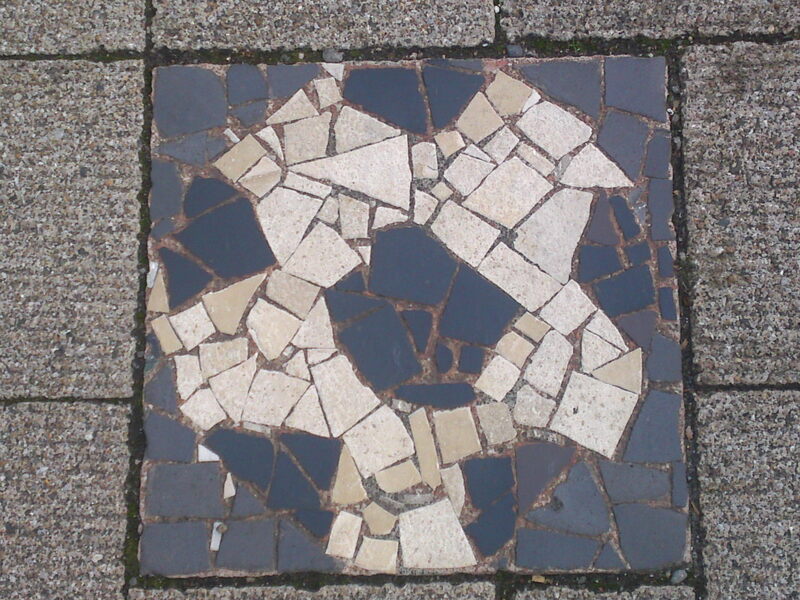 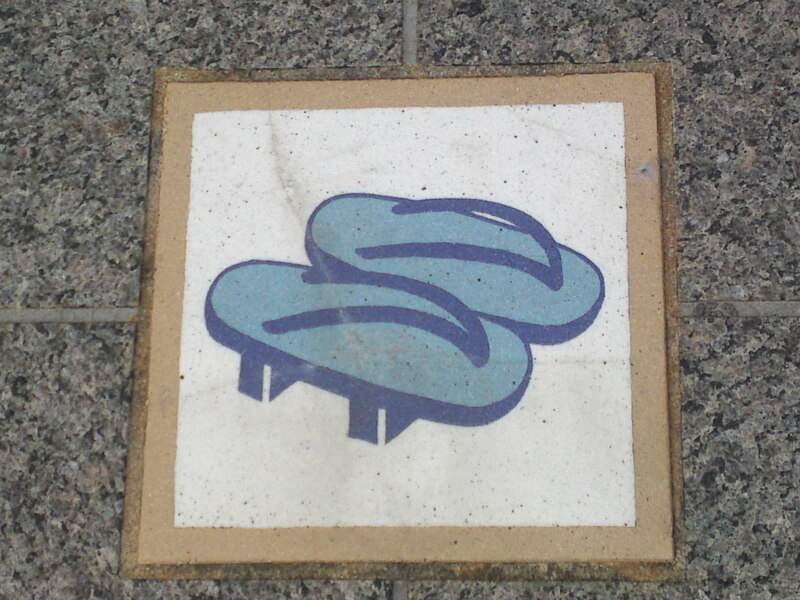 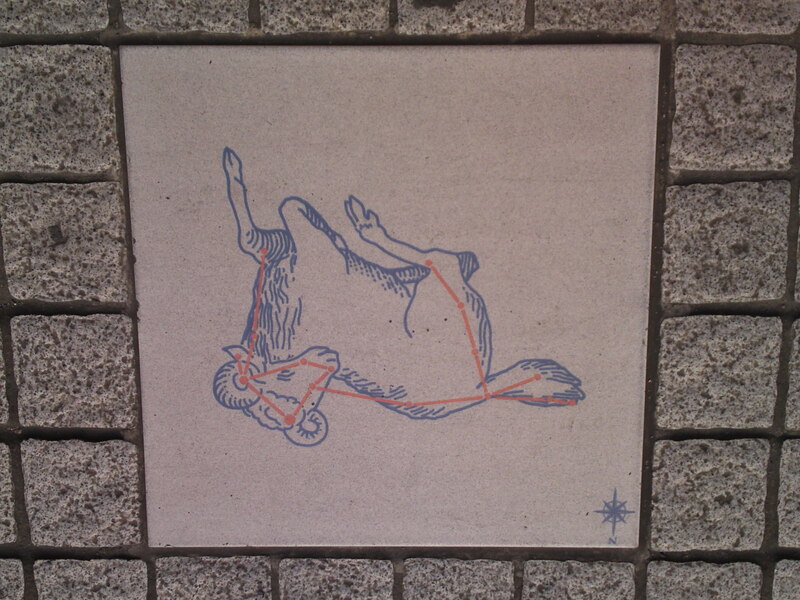 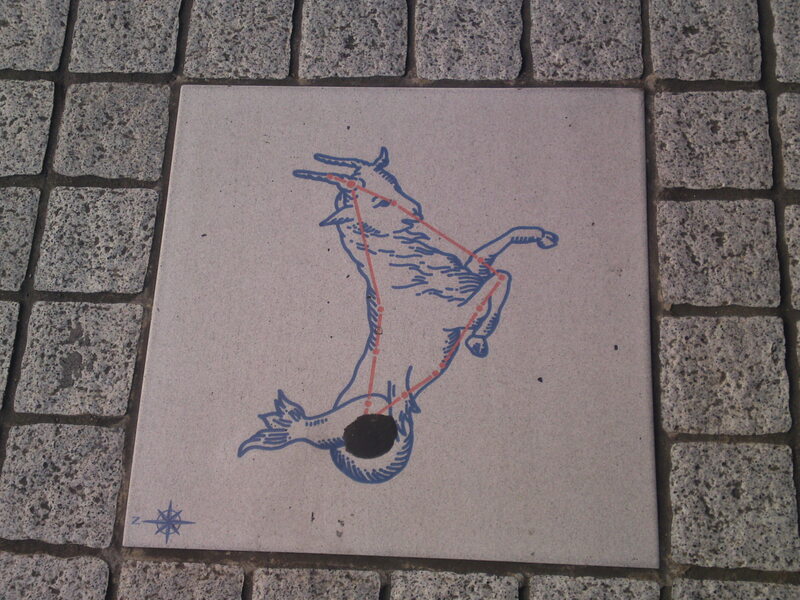 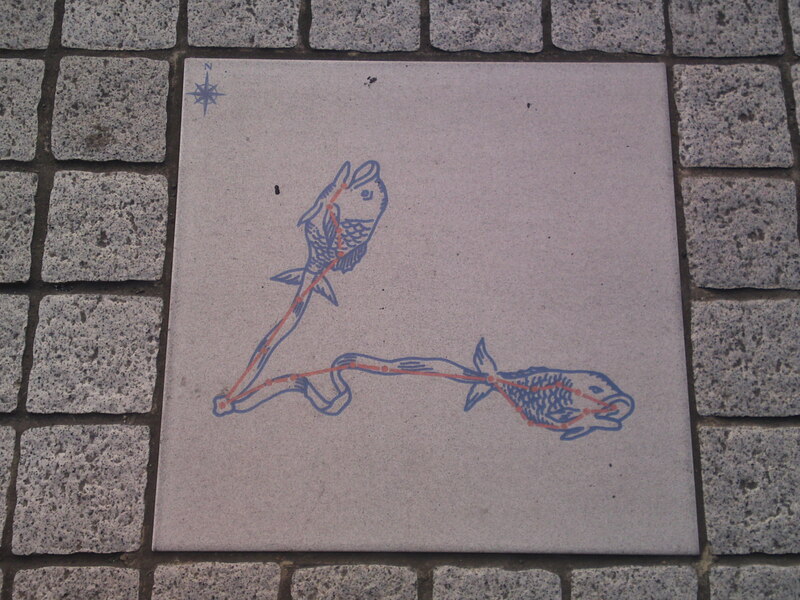 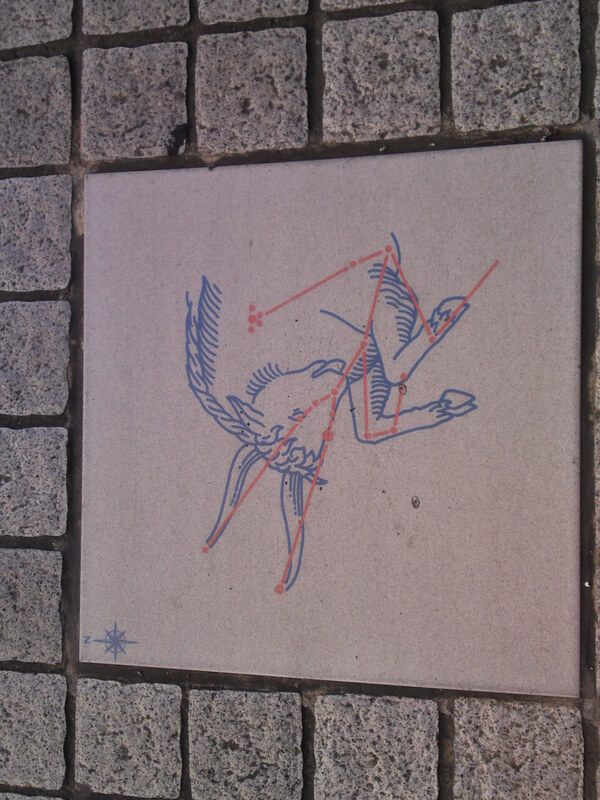 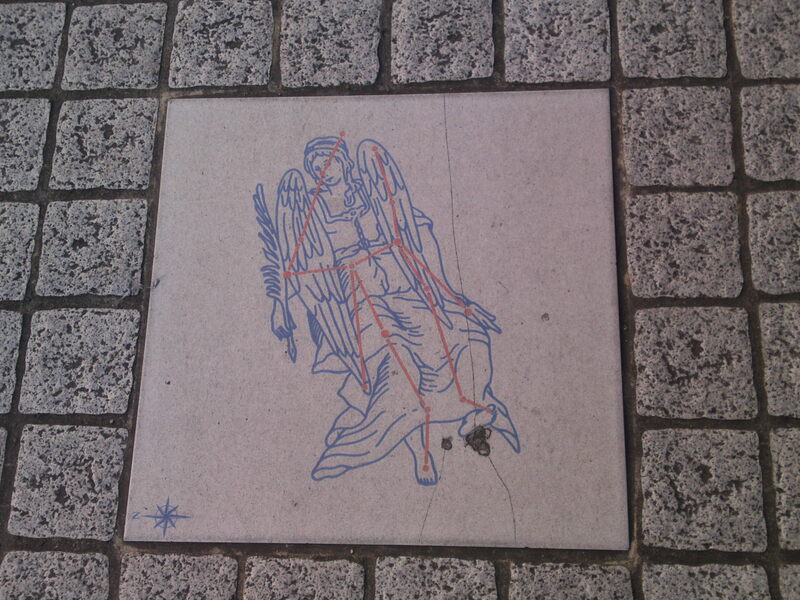 Urban Art: Zodiac Pavement Tiles in Hamamatsu City! 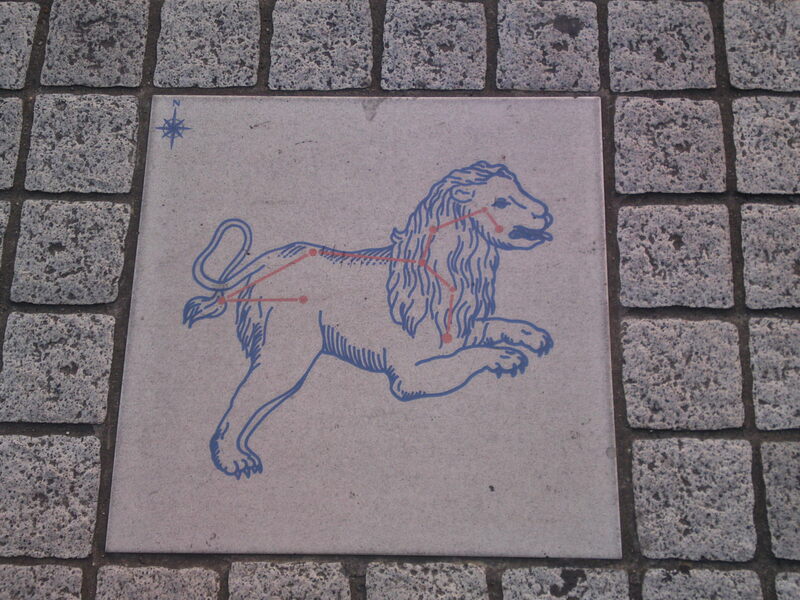 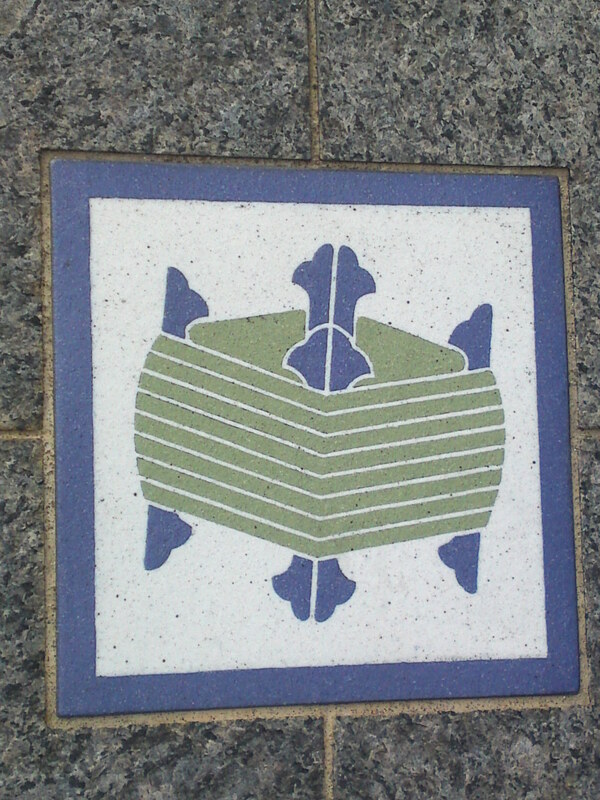 If you go out of Hamamatsu JR Station and through the North Exit and then walk between the railway line and the ACT CITY Buildings you will discover tiles on the pavement describing the 12 symbols of the Zodiac! 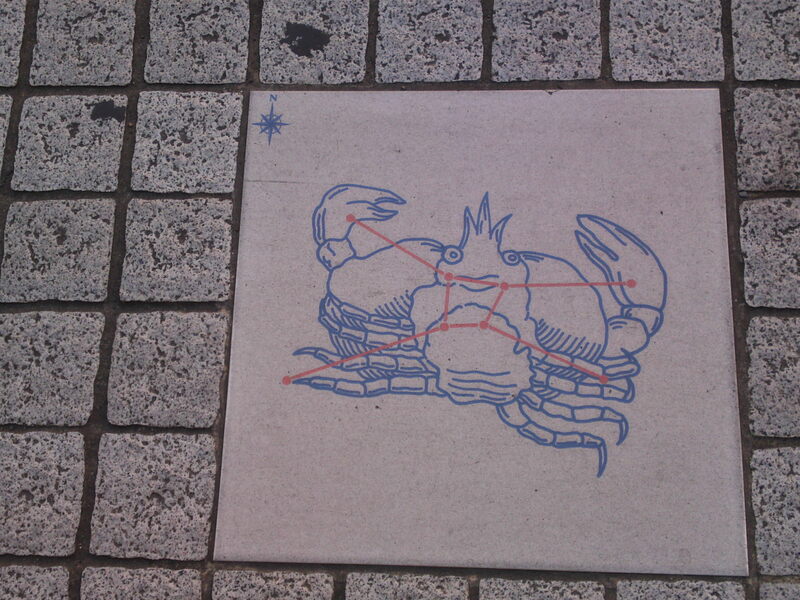 They are not following the order of the modern Zodiac as far as I could determine but I will introduce them below in the walking order! 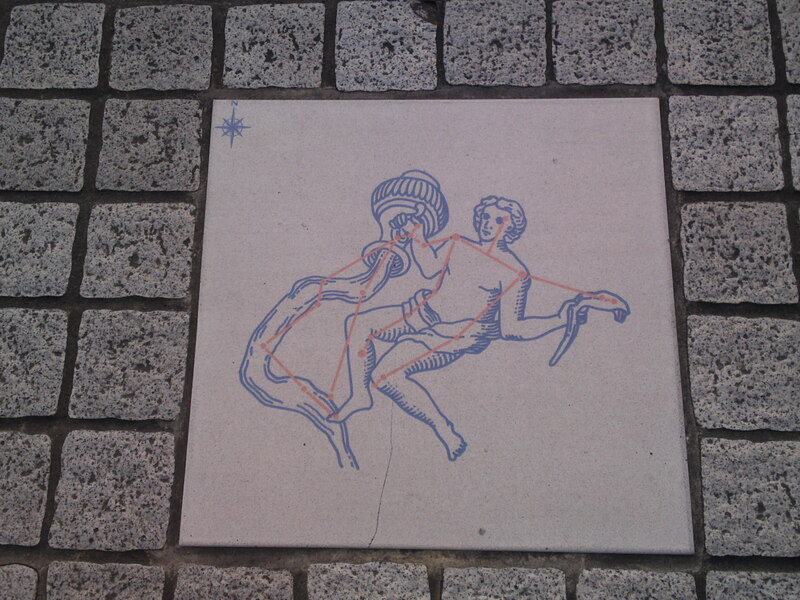 For a bit of interesting study I included Zodiac order, symbol, the ecliptic longitudes, with their Latin, Greek, Sanskrit, and Babylonian names (but note that the Sanskrit and the Babylonian name equivalents denote the constellations only, not the tropical zodiac signs). 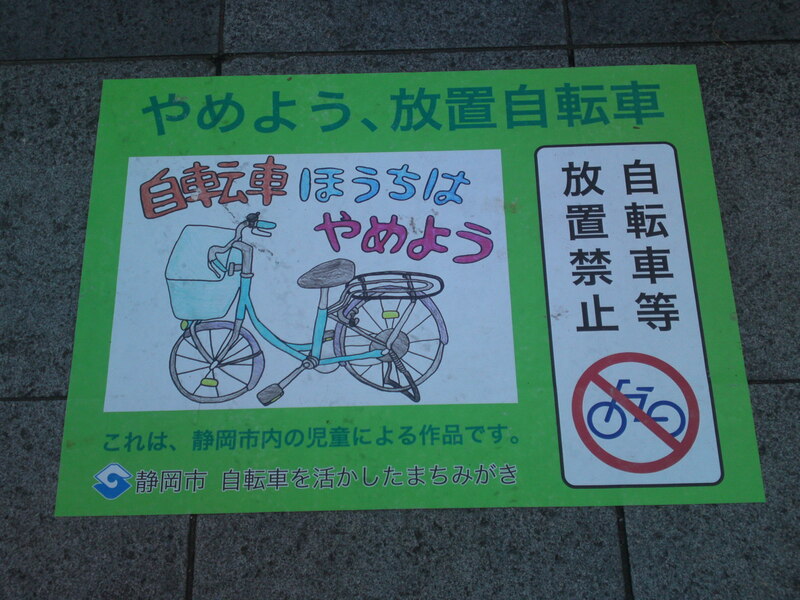 Also, the “English translation” is not usually used by English speakers. 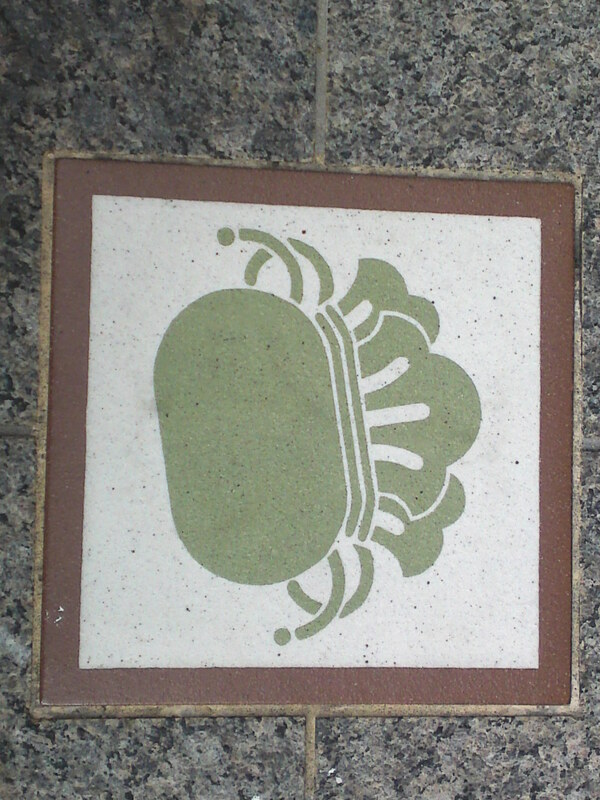 The Latin names are standard English usage. 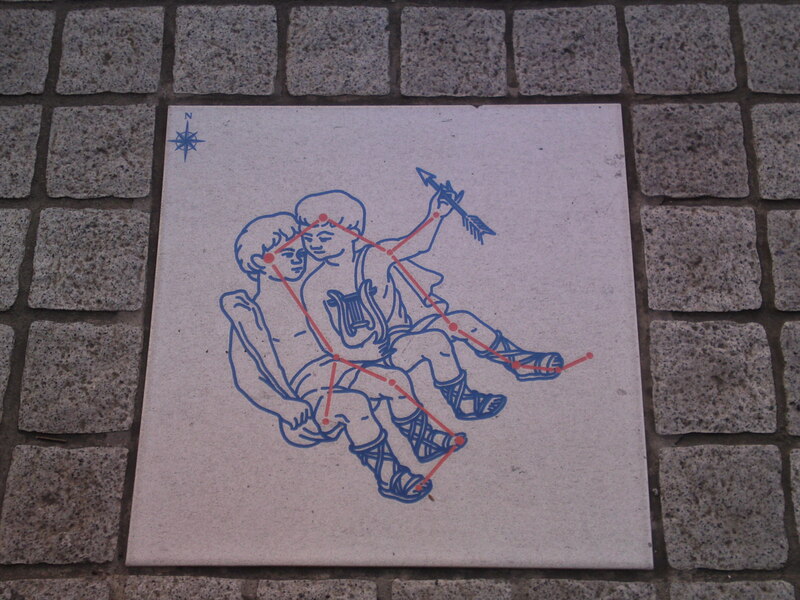 Traditional Trades in Japan on Pavement Tiles in Gofuku Chyo, Shizuoka City! 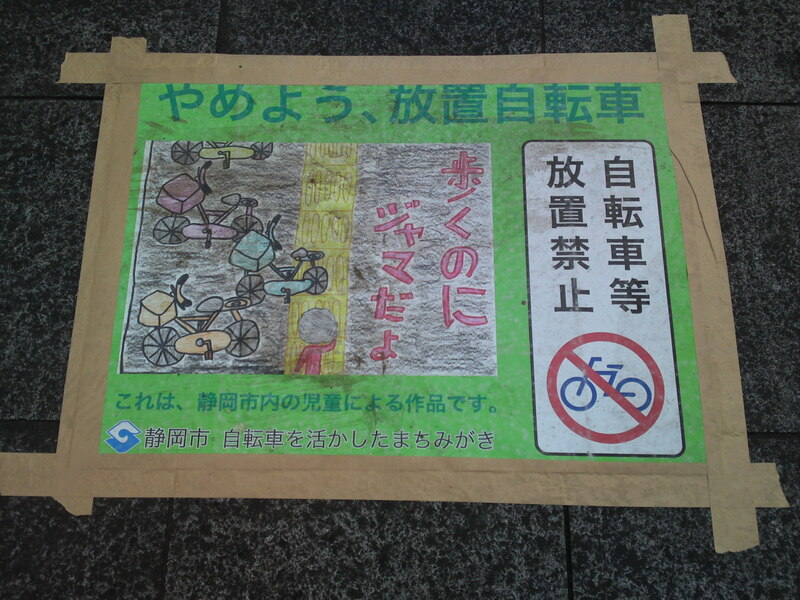 It is always a welcome surprise to discover Japanese traditions being promoted in the most unconventional ways! 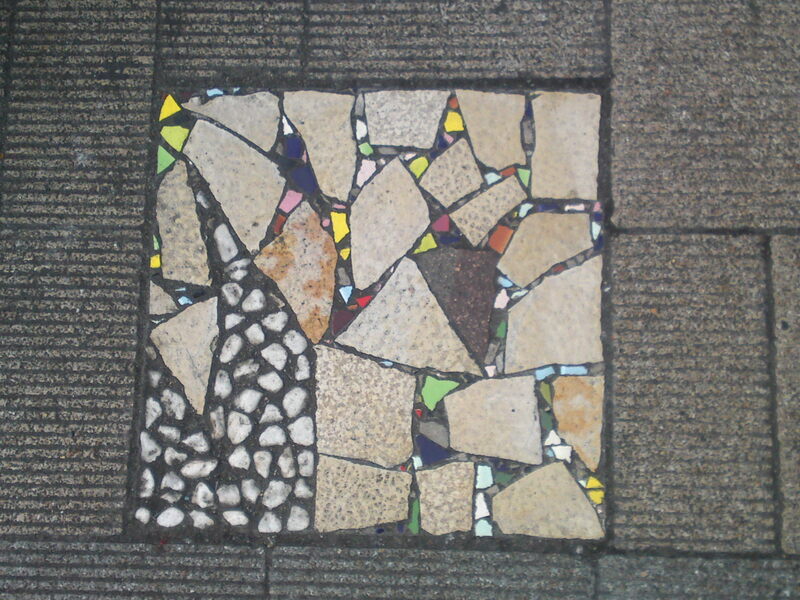 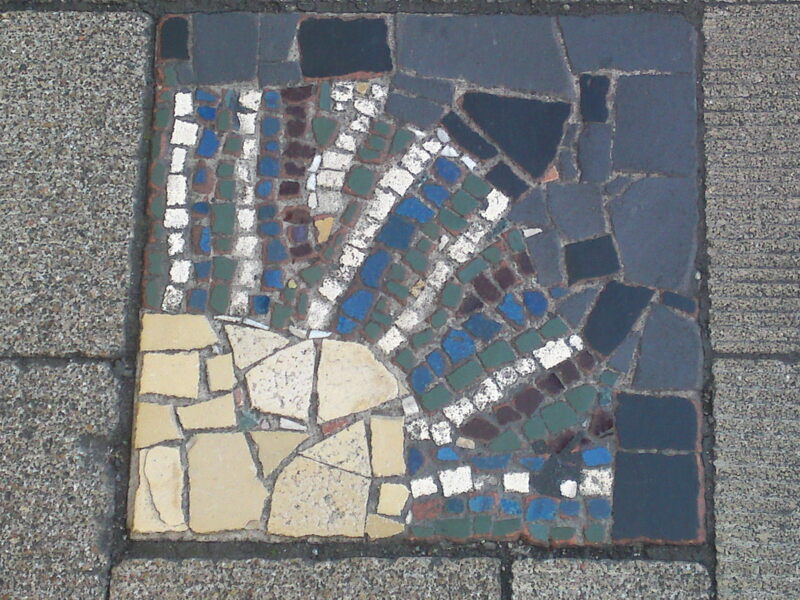 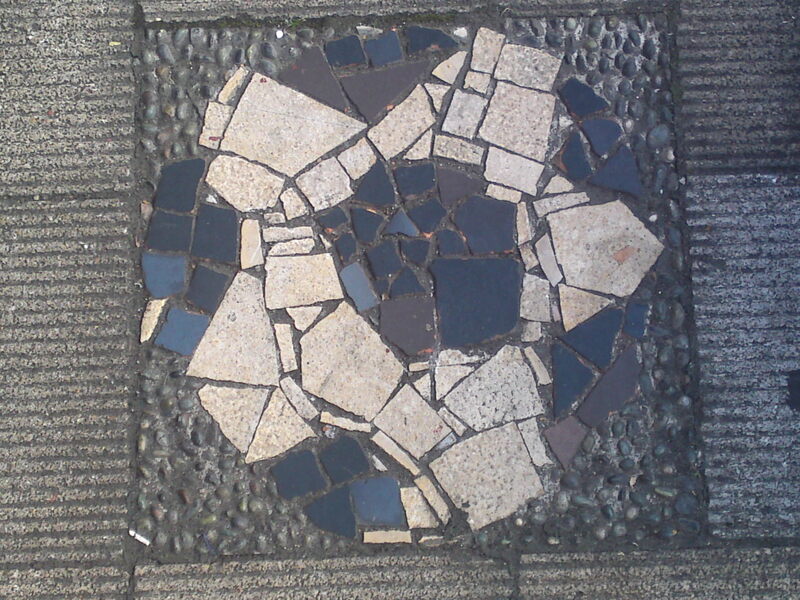 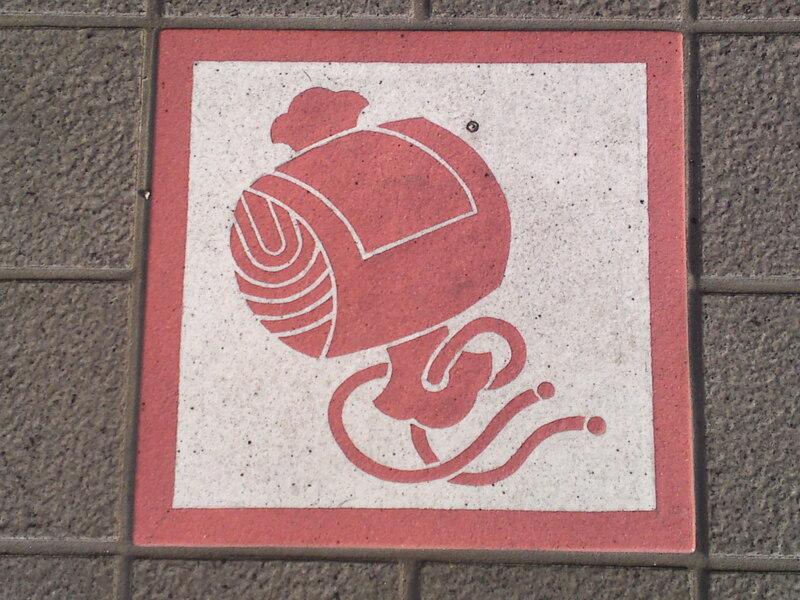 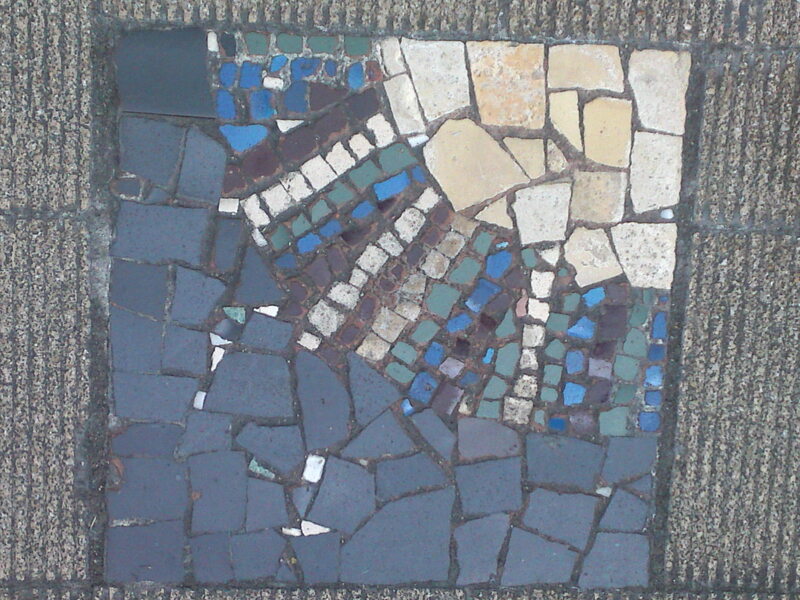 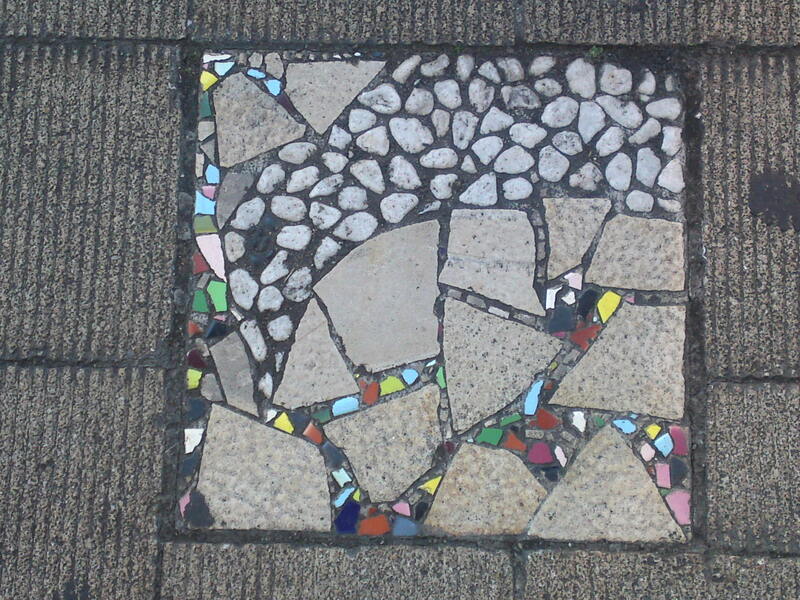 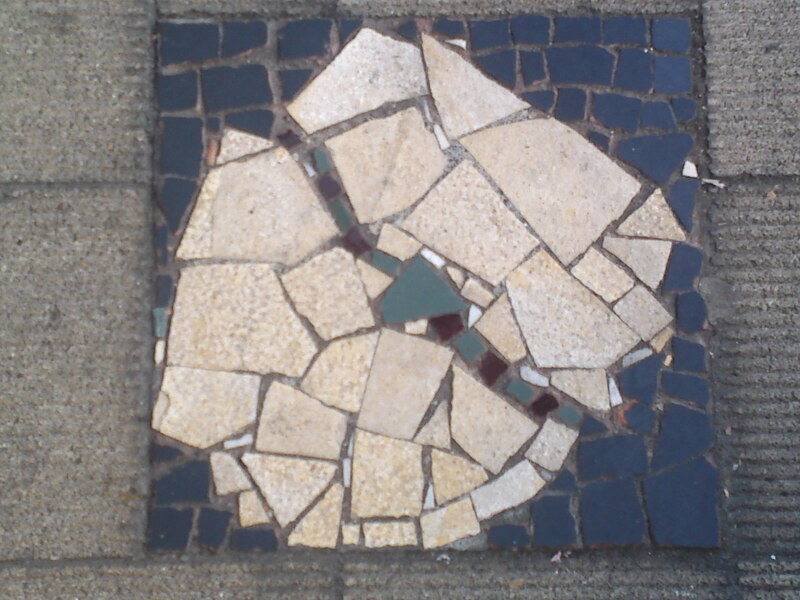 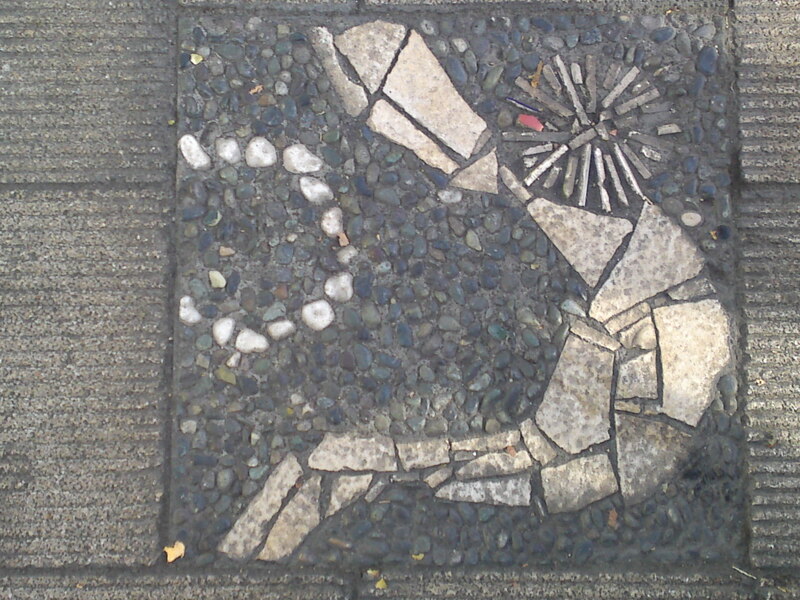 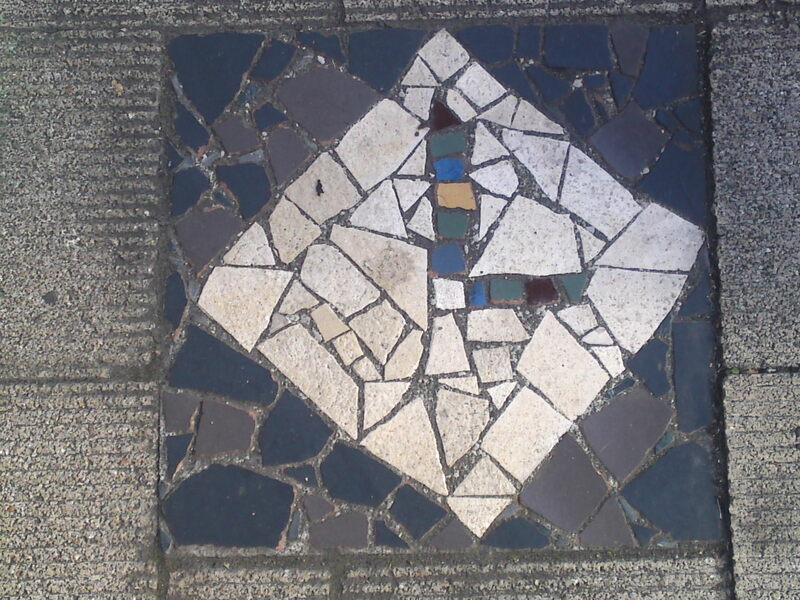 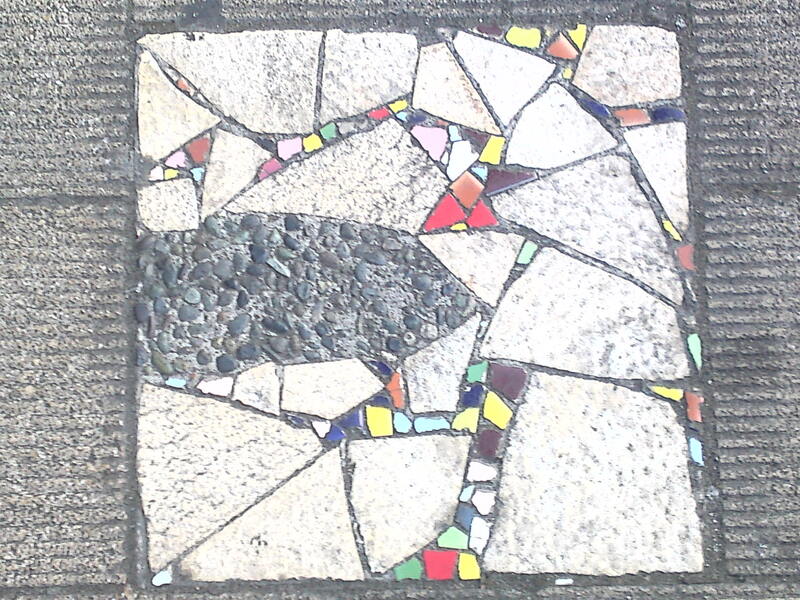 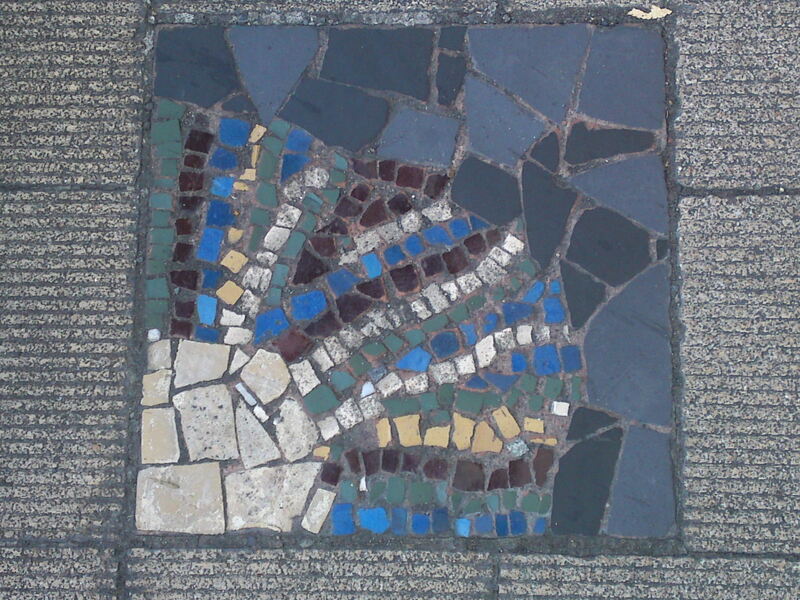 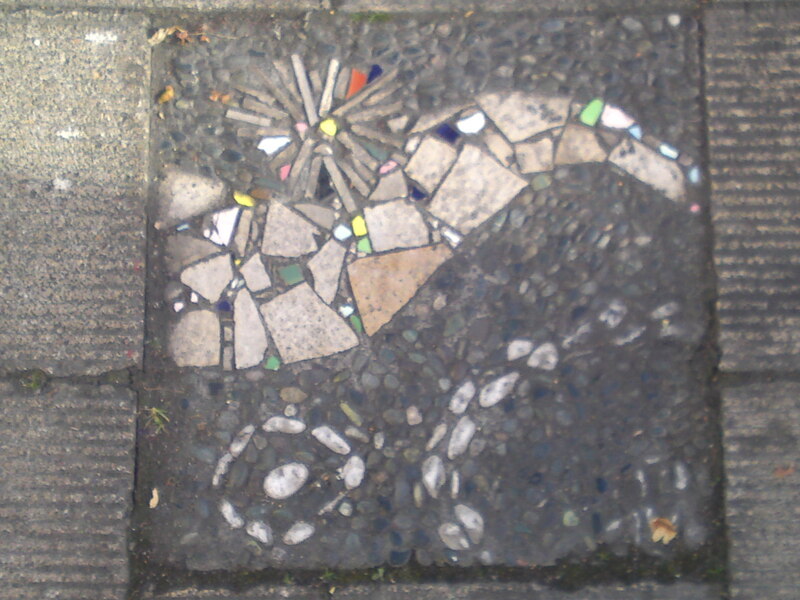 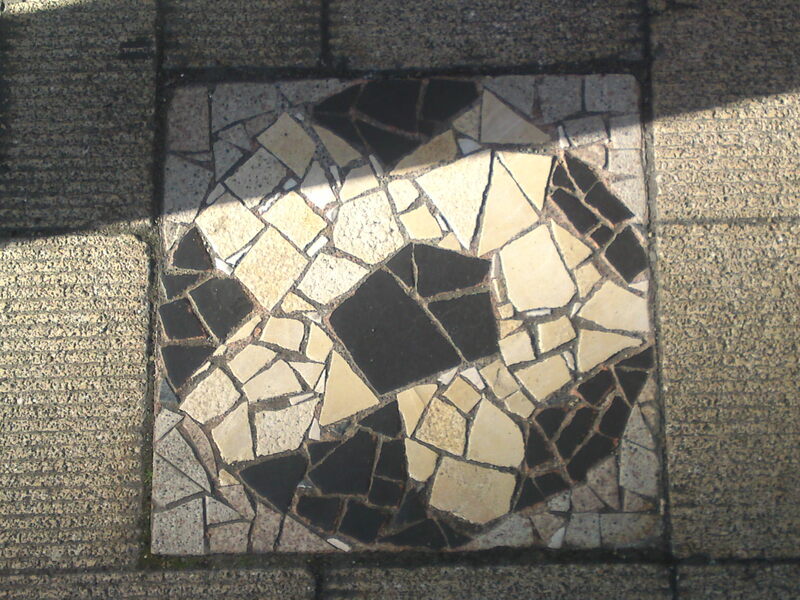 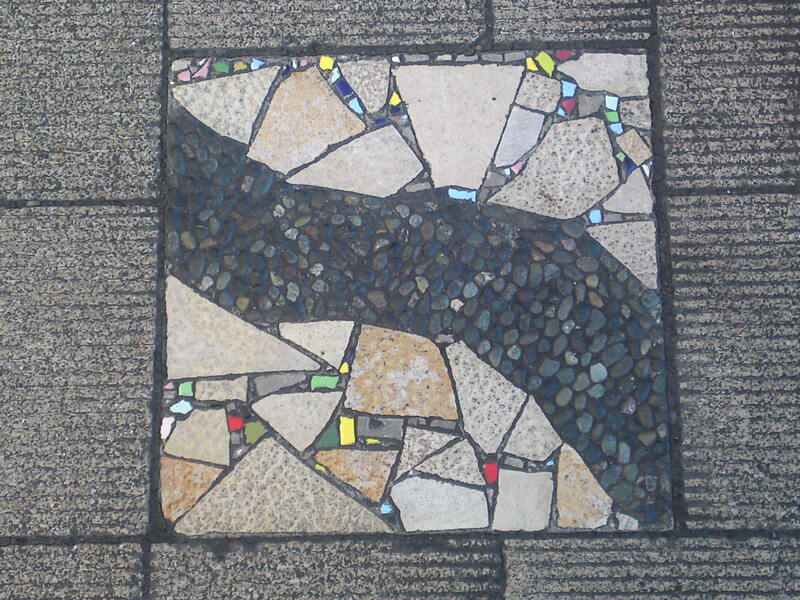 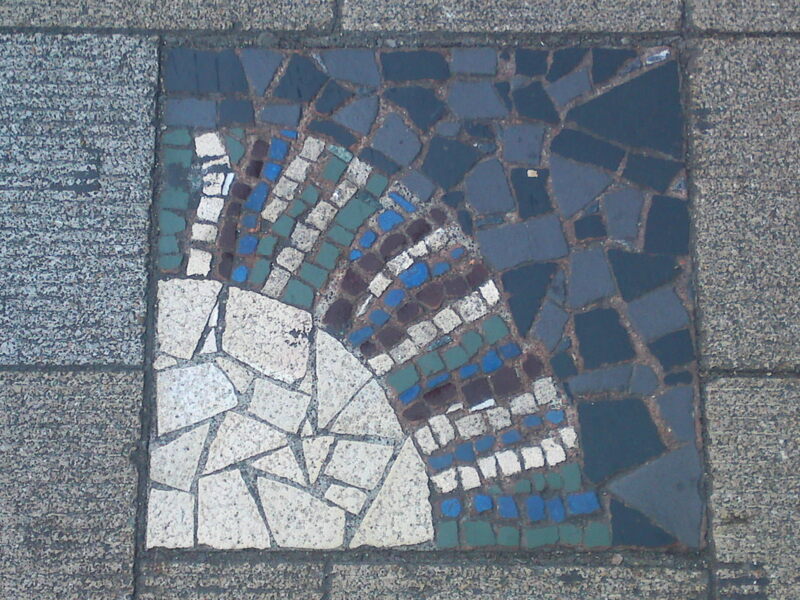 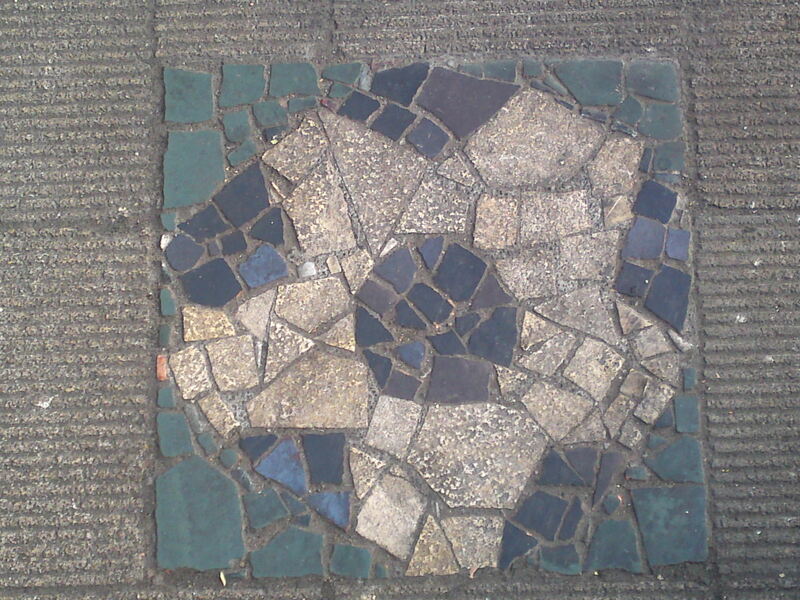 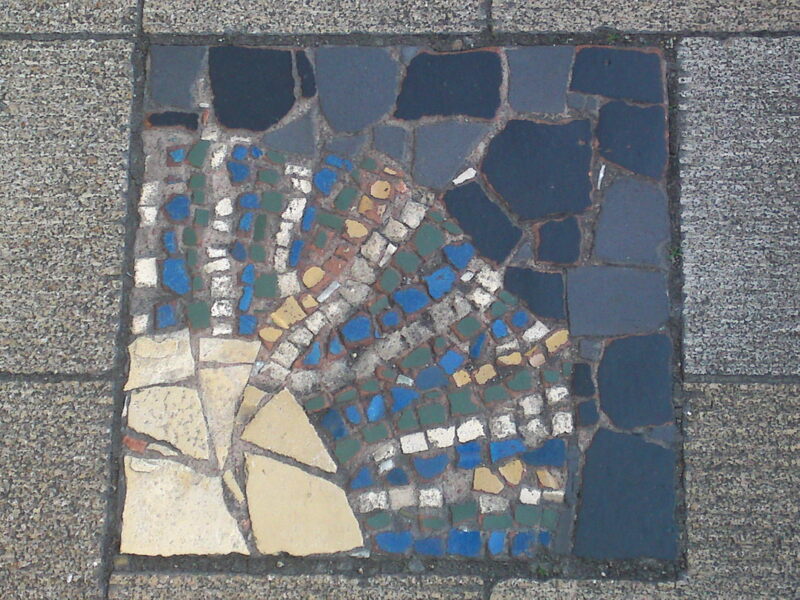 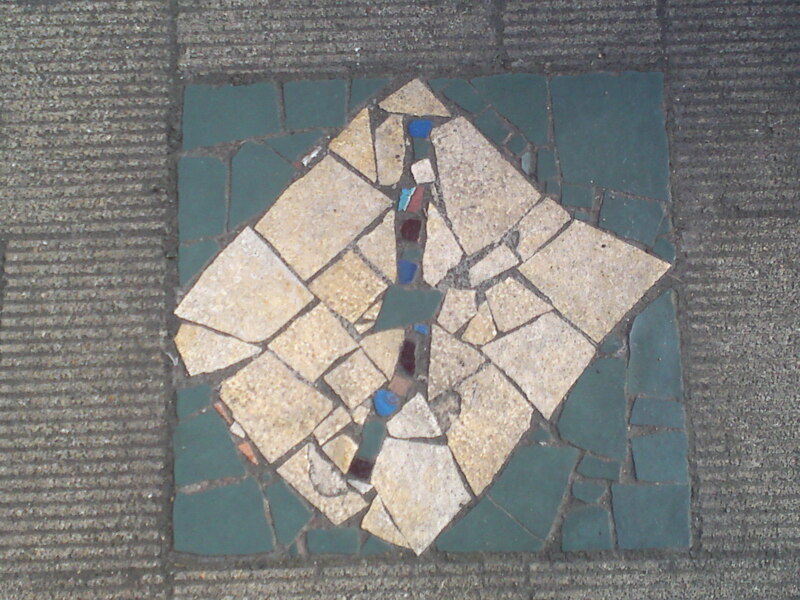 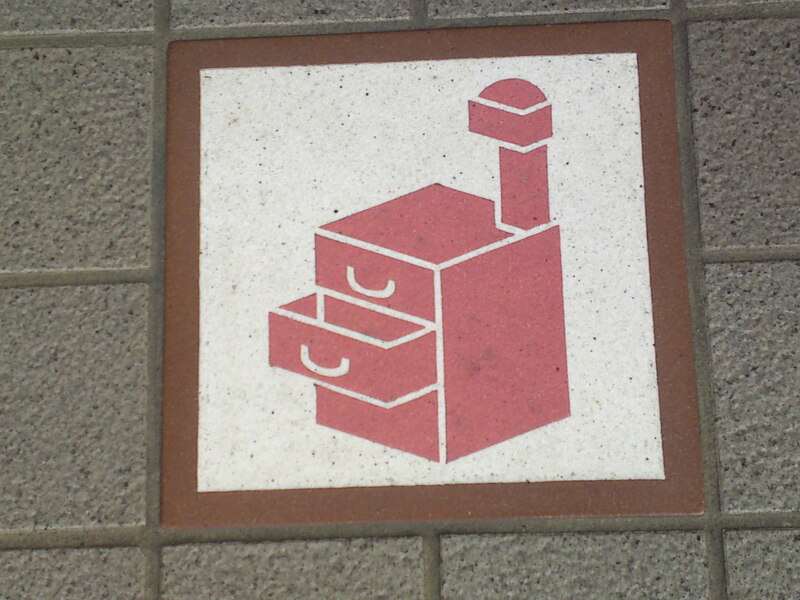 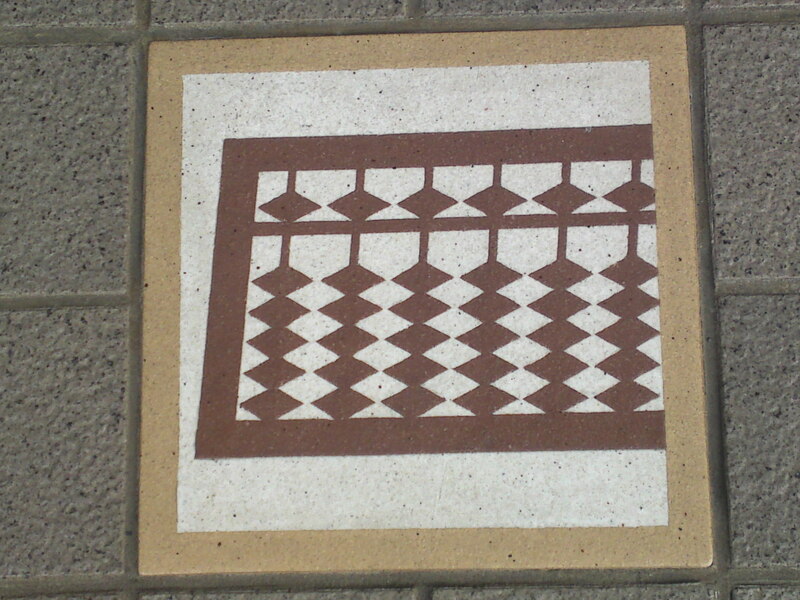 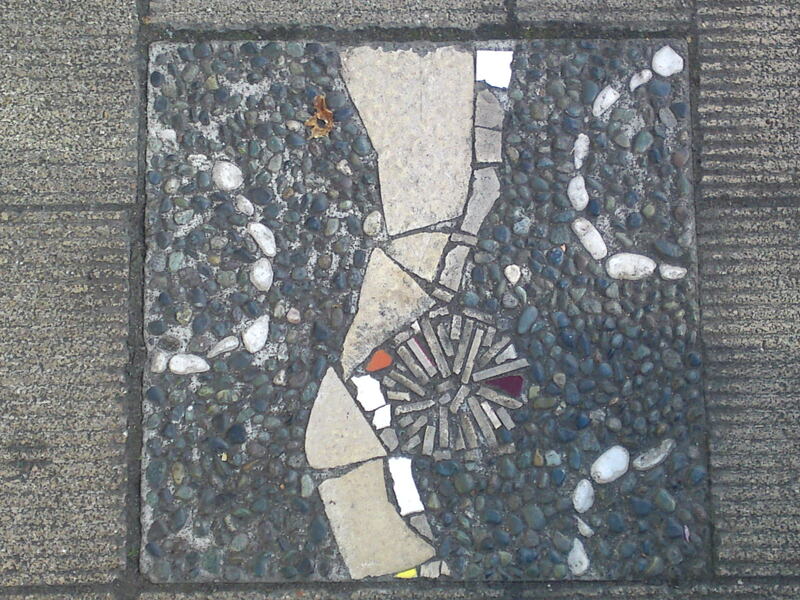 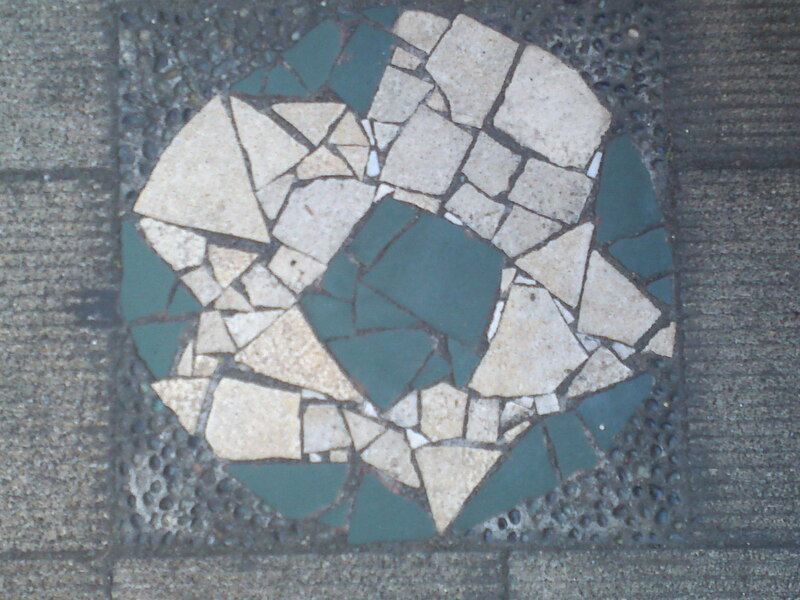 The other day Dragon pointed out some interesting tiles at the Hon Toori entrance of of Gofuku Chyo Street! 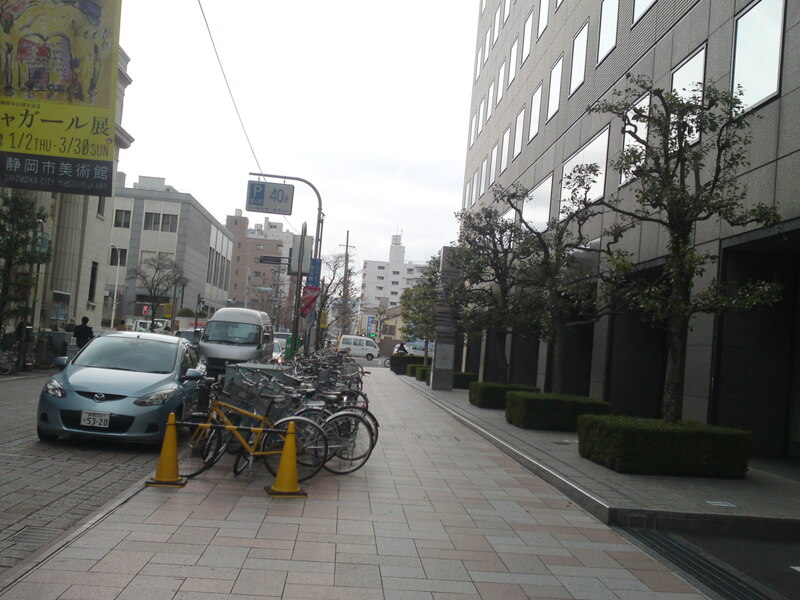 Right across from the Shizuoka Bank! 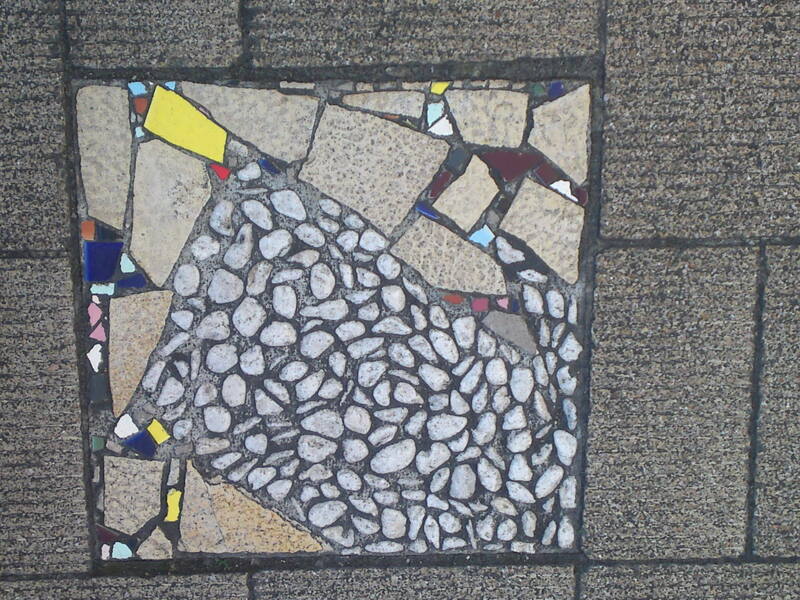 Can you see them on the pavement? 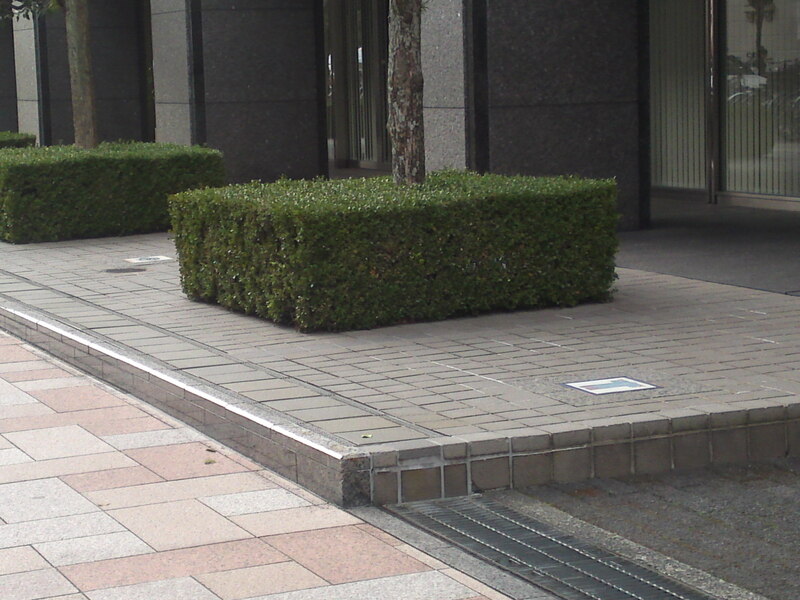 I decided to investigate them a bit more seriously yesterday! 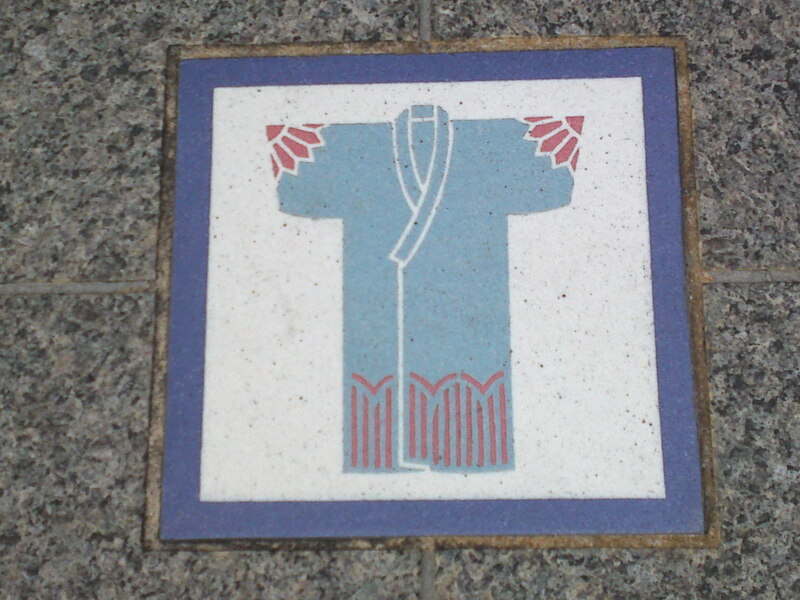 “Gofuku CChyo/呉服町” means the “Clothing District”, that is in Edo Times cities were divided into districts according to their main trade. 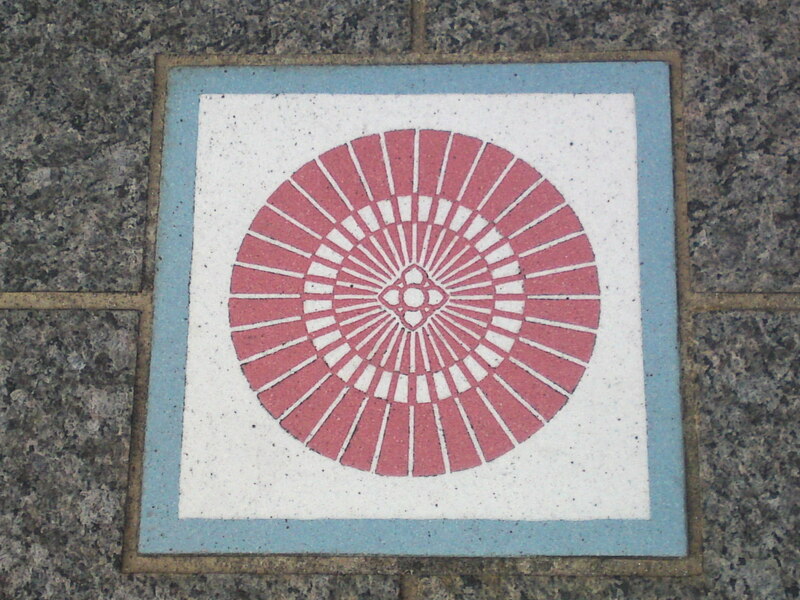 Clothing and associated trades were concentrated in that particular area of Fuchu/Sumpu as Shizuoka City as it was called when the Shogun/overlord Tokugawa Ieyasu retired there in the 17th Century! 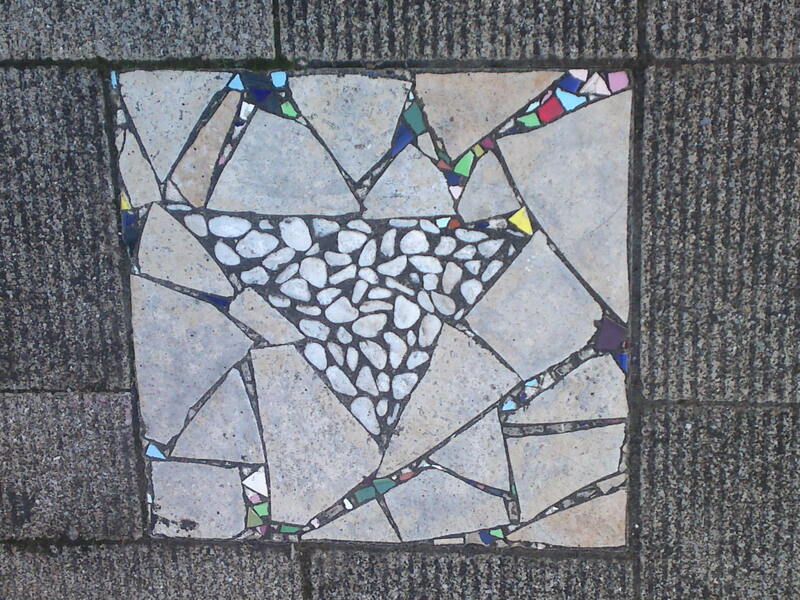 Shizuoka geta are still famous all over Japan! 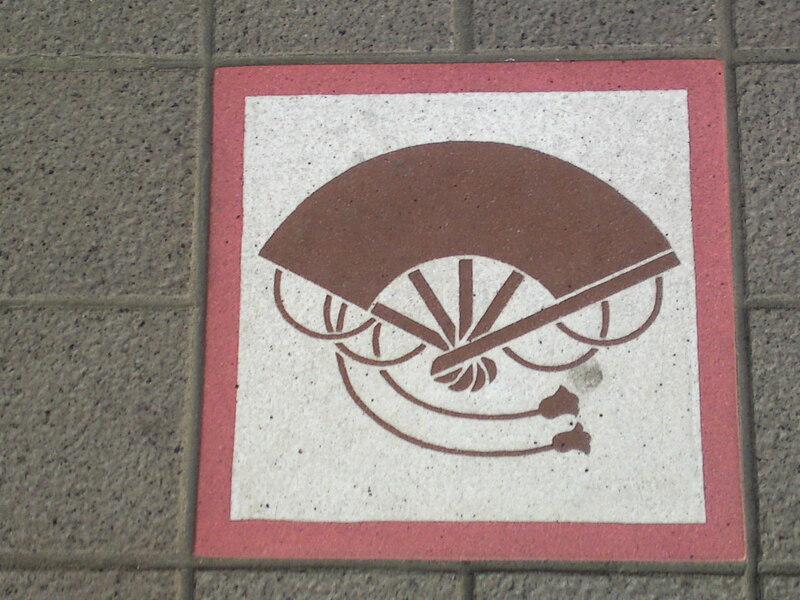 Japanese umbrella represented from from overhead! 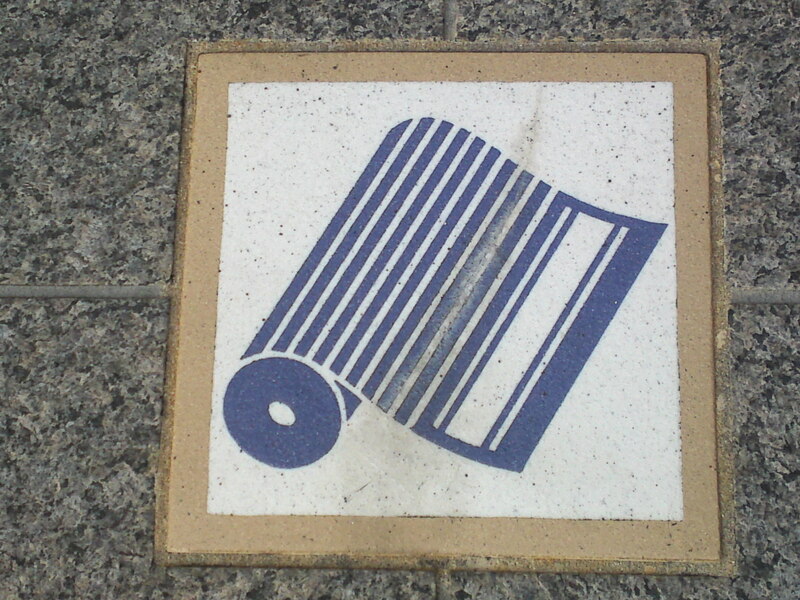 Cross sections of rolls of cloth! 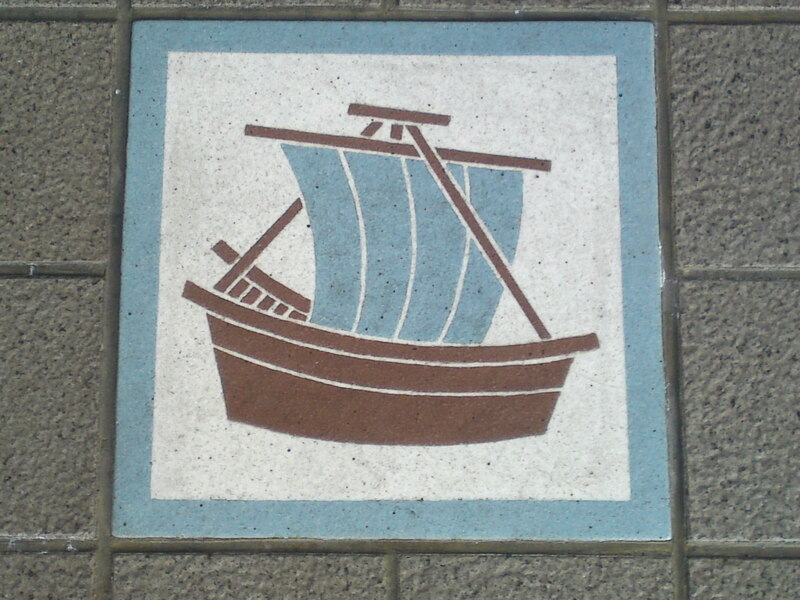 Fine boat sails also used to be manufactured there! 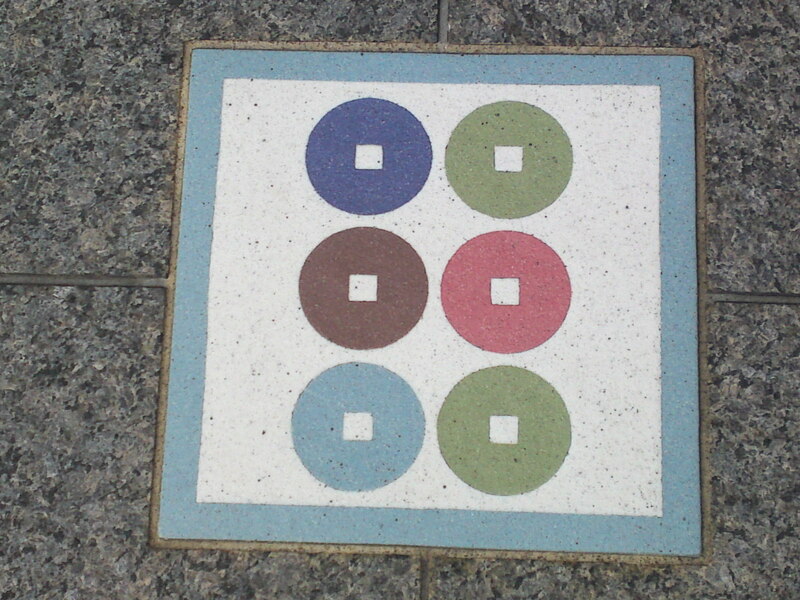 Money had to be tallied! 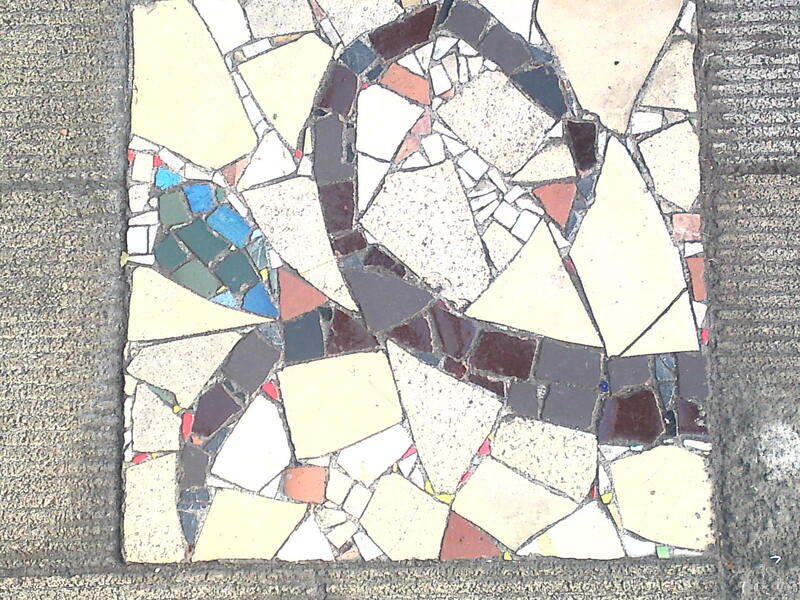 A ceremonial mallet used as a rattler during festivals! 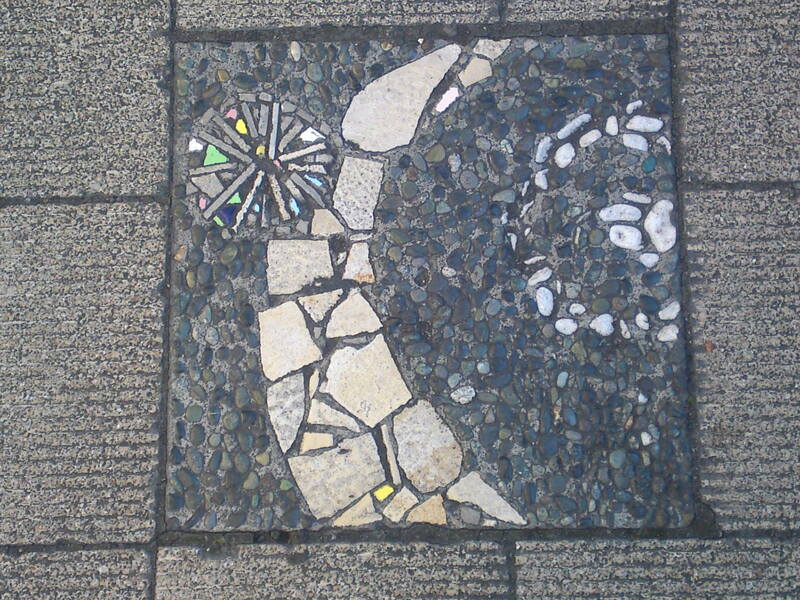 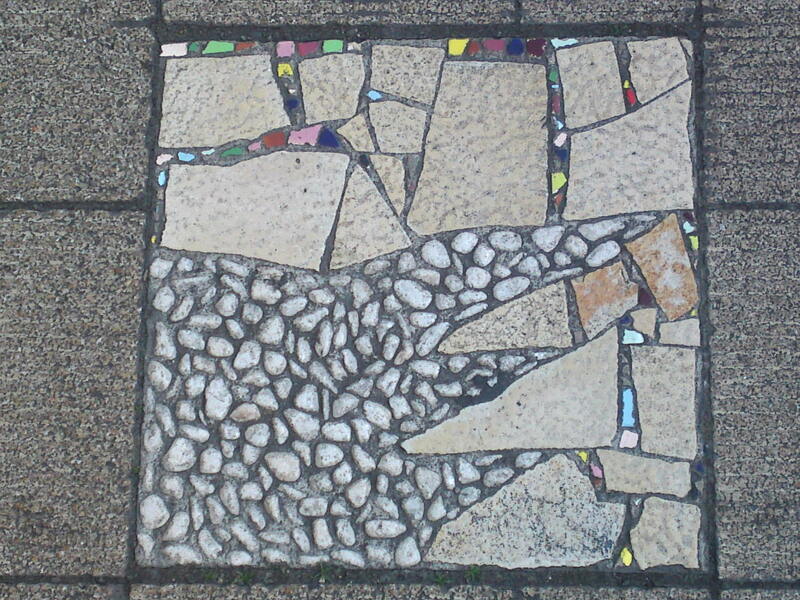 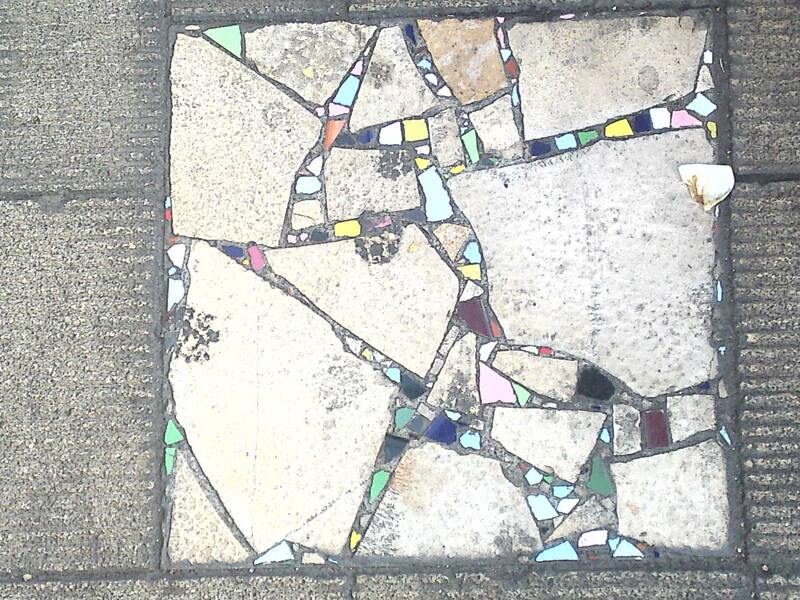 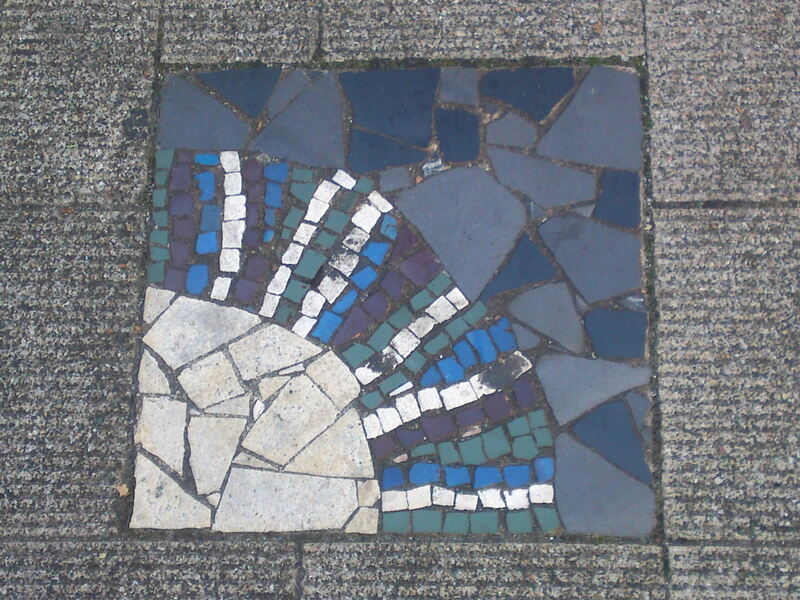 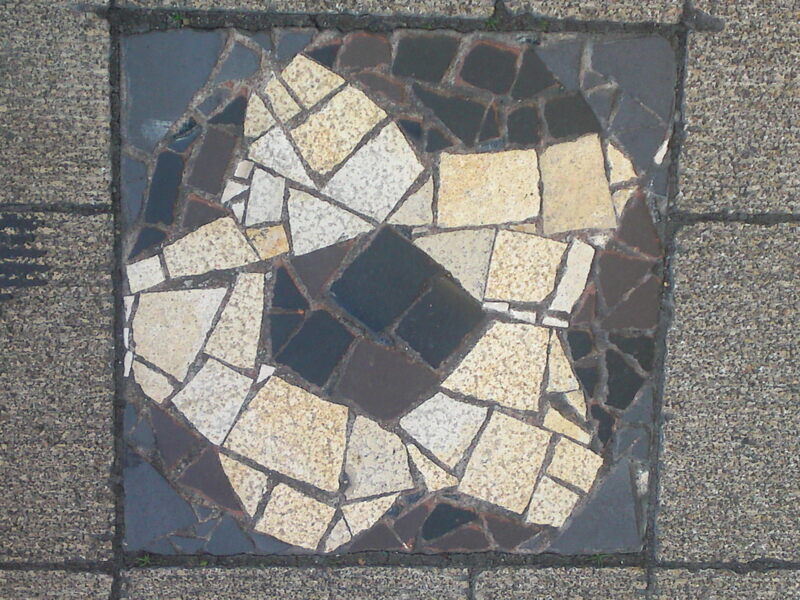 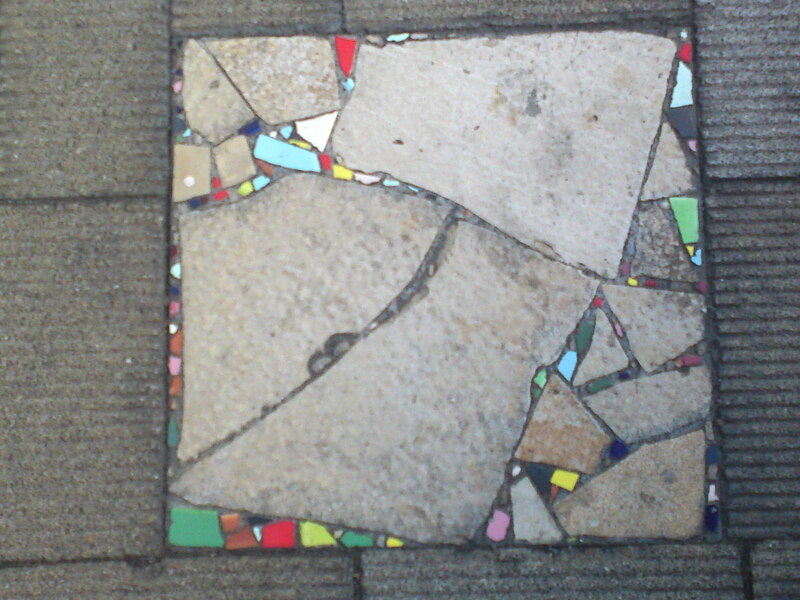 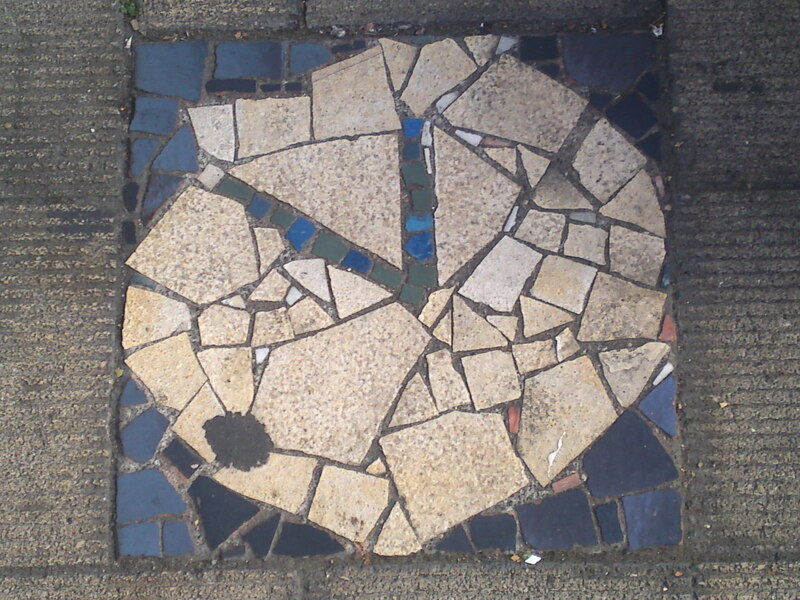 Pavement Art? 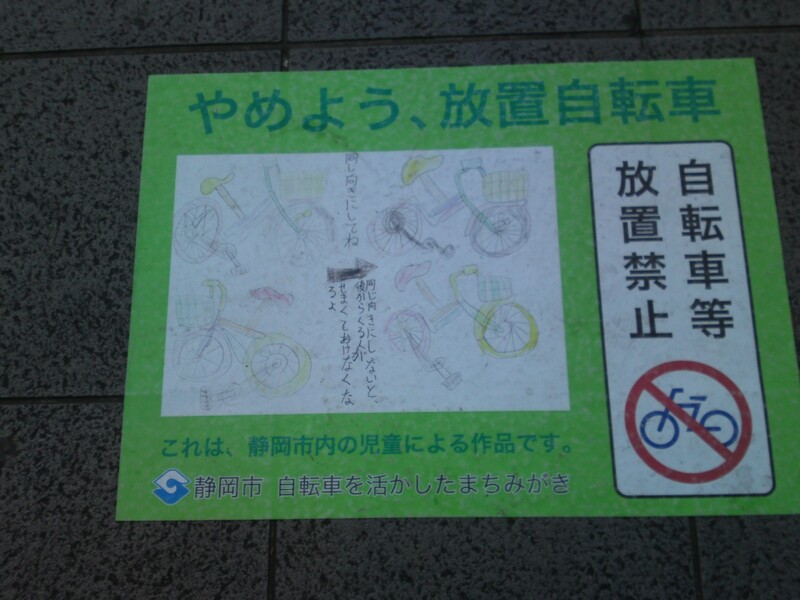 Illegal Bicycle Parking Children’s Drawings Posters in Shizuoka City! 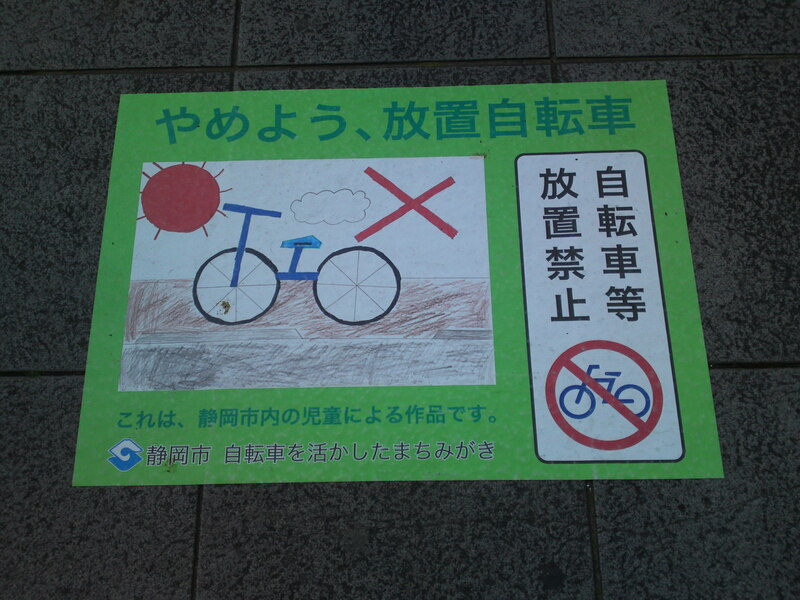 Some kids do have a great imagination to reflect on the plight of a bicycle! 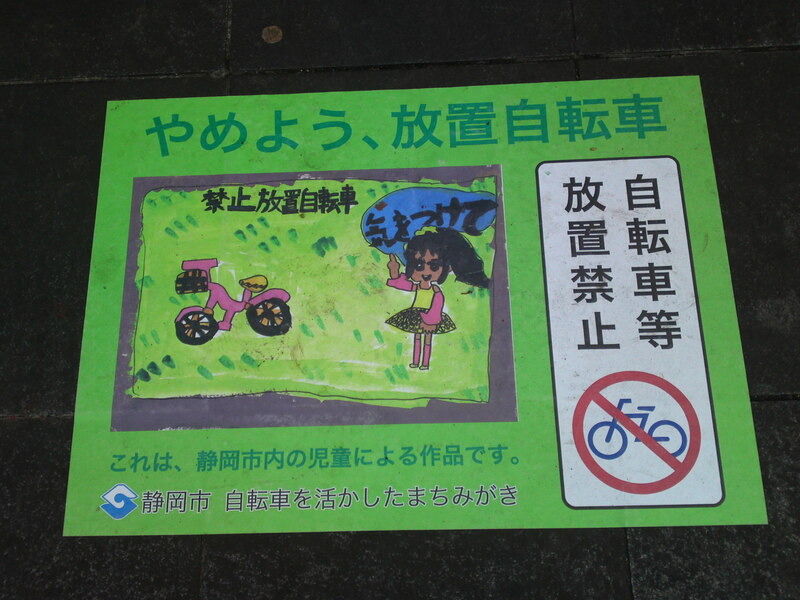 Shizuoka City is apparently the city in Japan with the largest number of bicycles per capita, but the least that could be said it seems an open war has been ignited between the bicycle owners who do not know where to park them and the city which is spending money on large stickers applied on the pavements in some areas of the city! 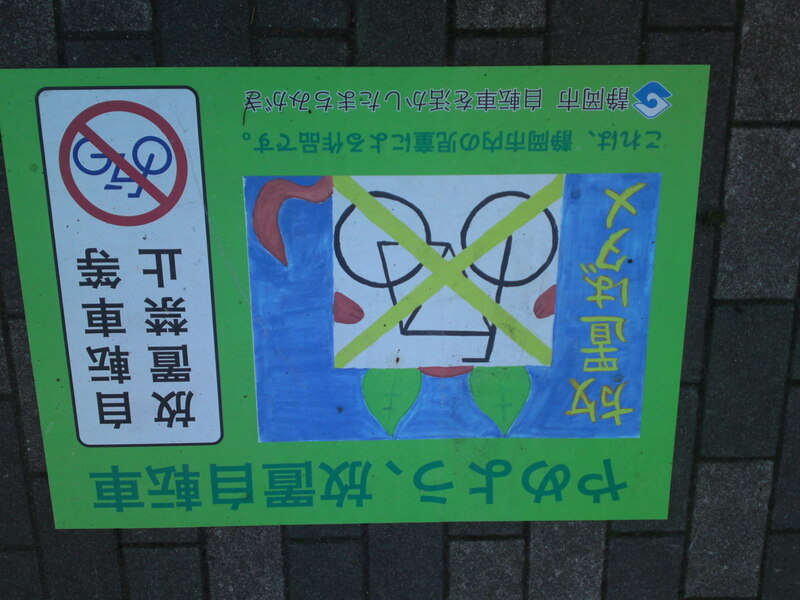 The sign posters in this article were all found in Aoba Park Street in Aoi Ku, Shizuoka City, starting from behind the city hall. 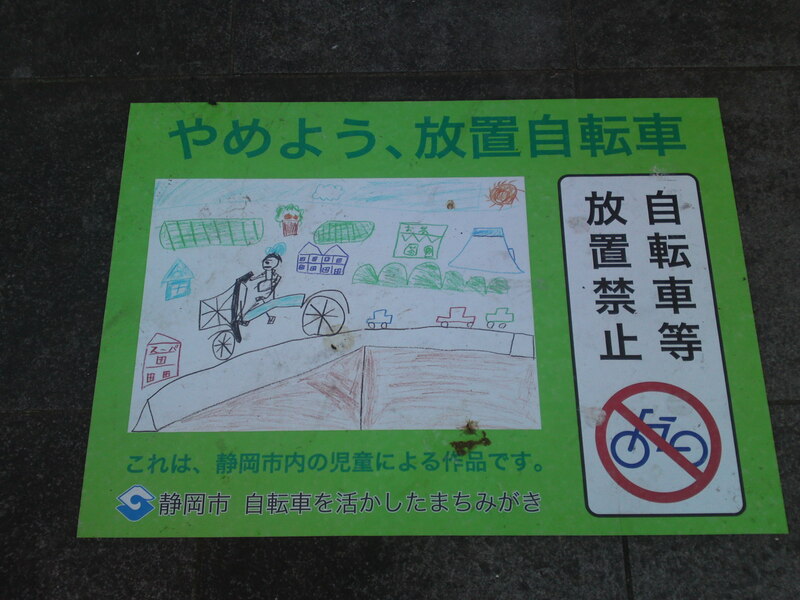 Primary/elementary school were drafted by the city government to draw different pictures to appeal the public recently and I just discovered these pictures recently. 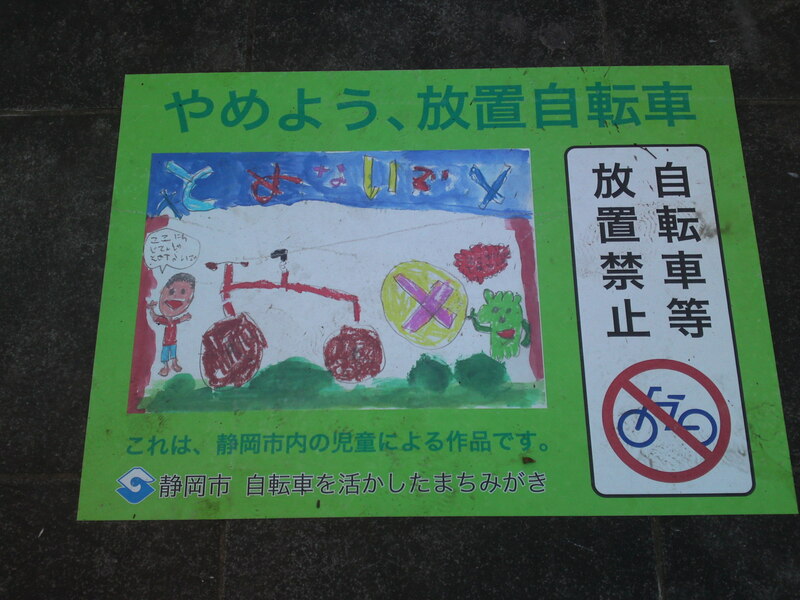 A young policeman seeing me taking pictures of them couldn’t hide his smile……..
Red seems to be the prevalent color for chidren tp express anger! 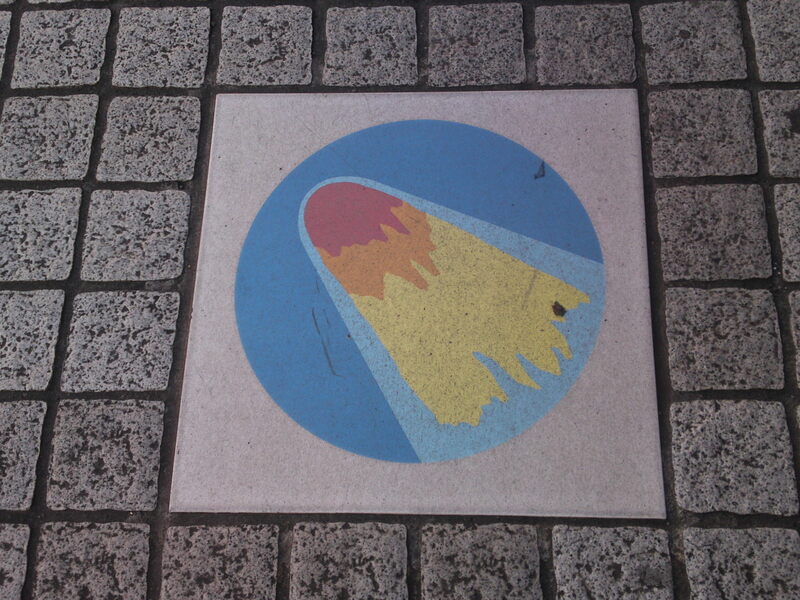 Why a sun and a cloud? 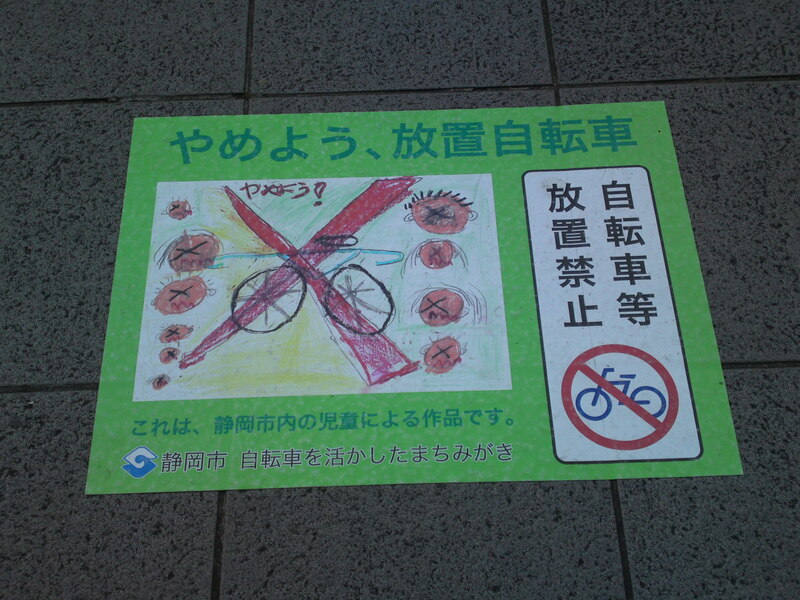 A forceful and concise message! 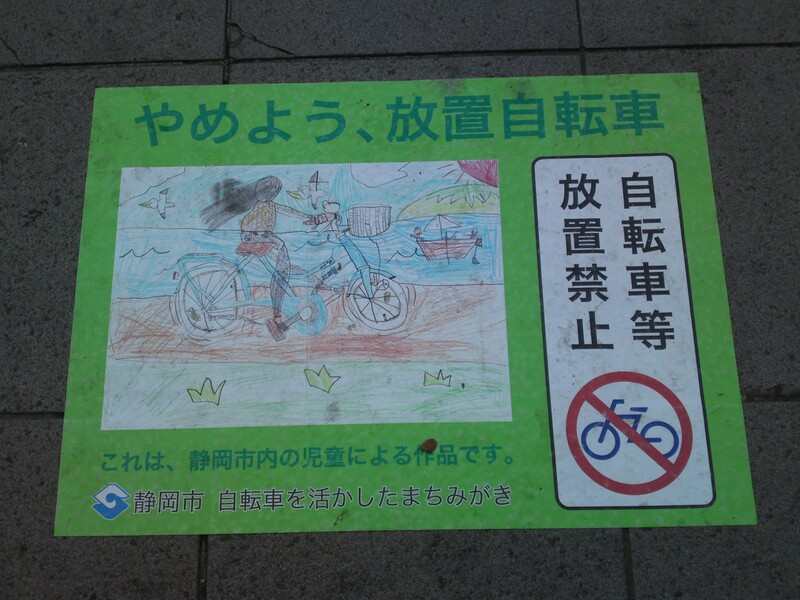 This kid is commenting on the lack of space left for pedestrians between rows of bicycles! 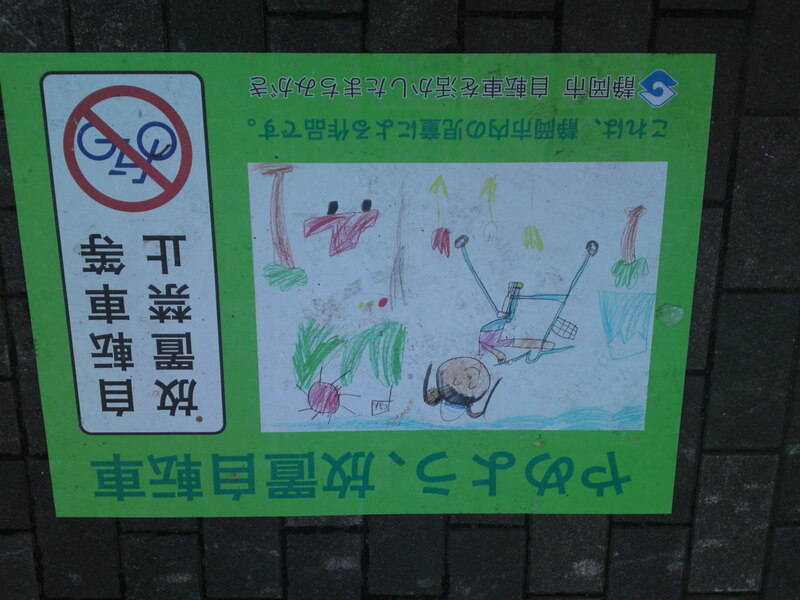 This kid decided to escape to the beach! 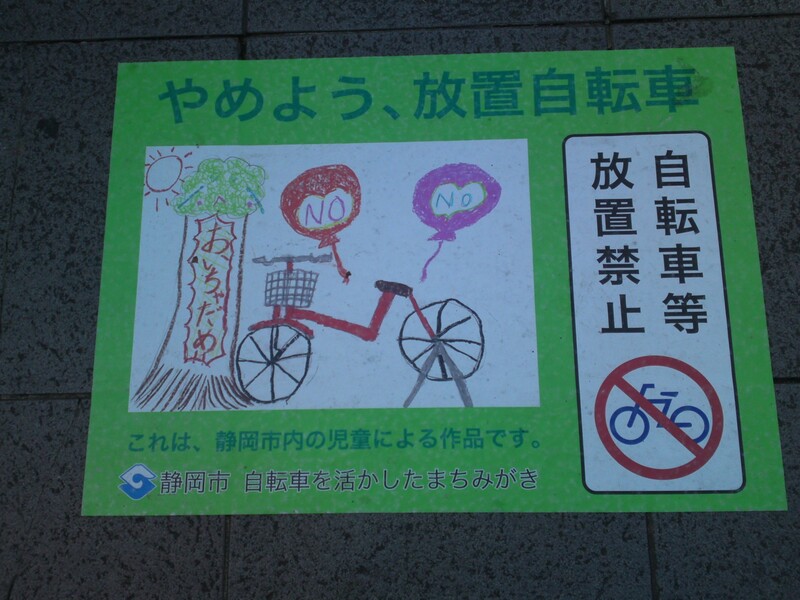 An interesting use of balloons! 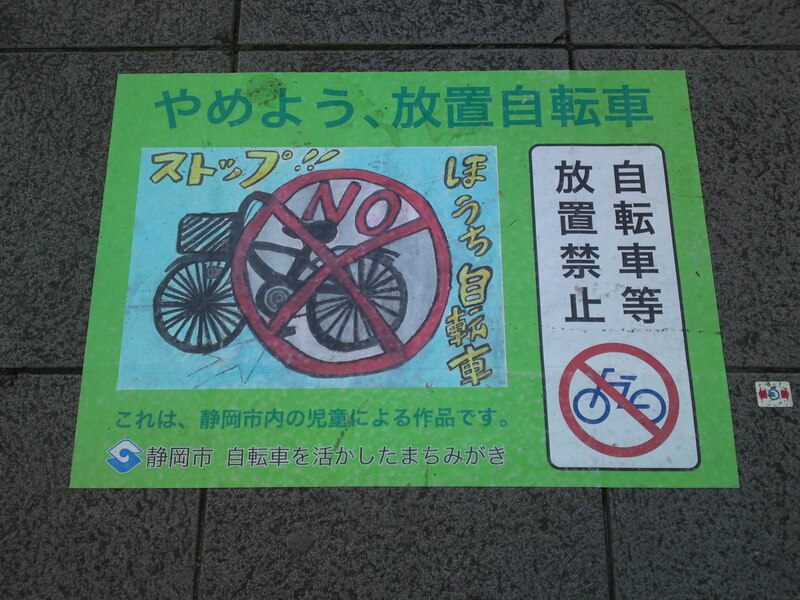 Beautiful bicycle, I must admit! 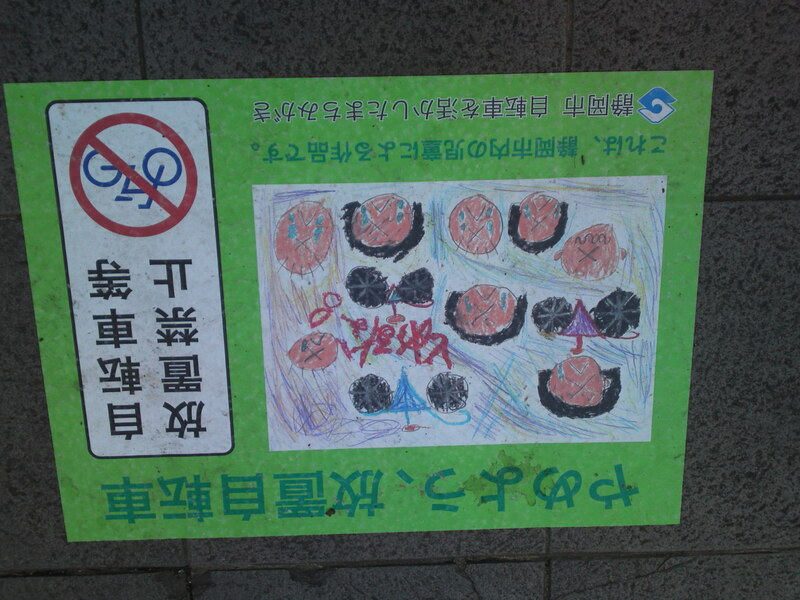 Is that a fox behind the poster? 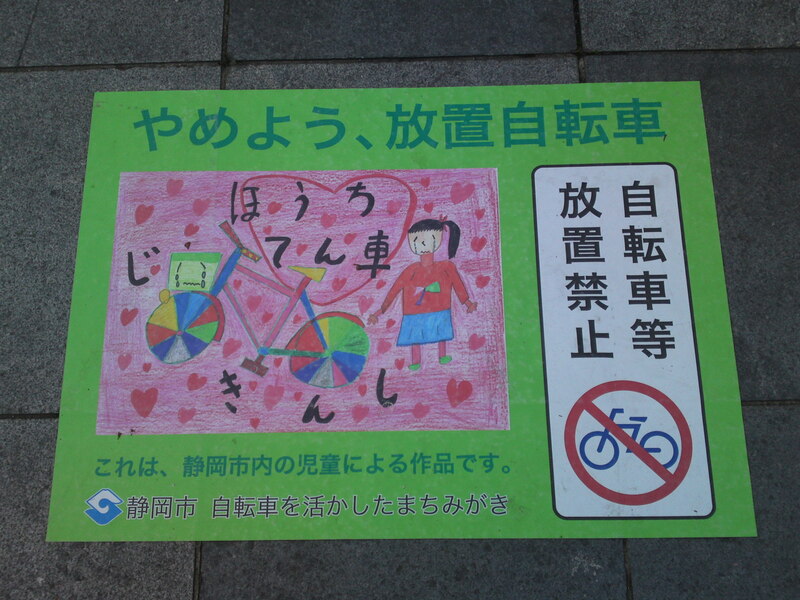 A lot of love for a bicycle! 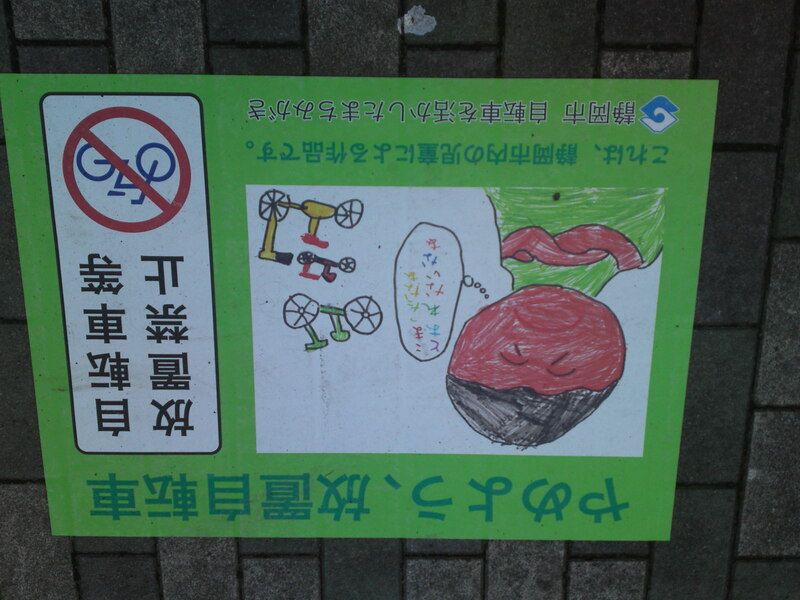 A child with an attitude! 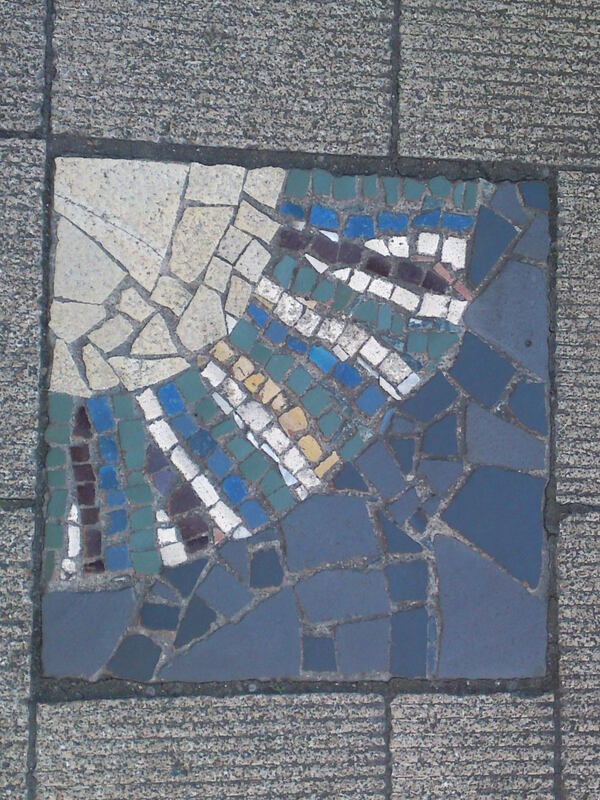 A girl with a sense of fashion? 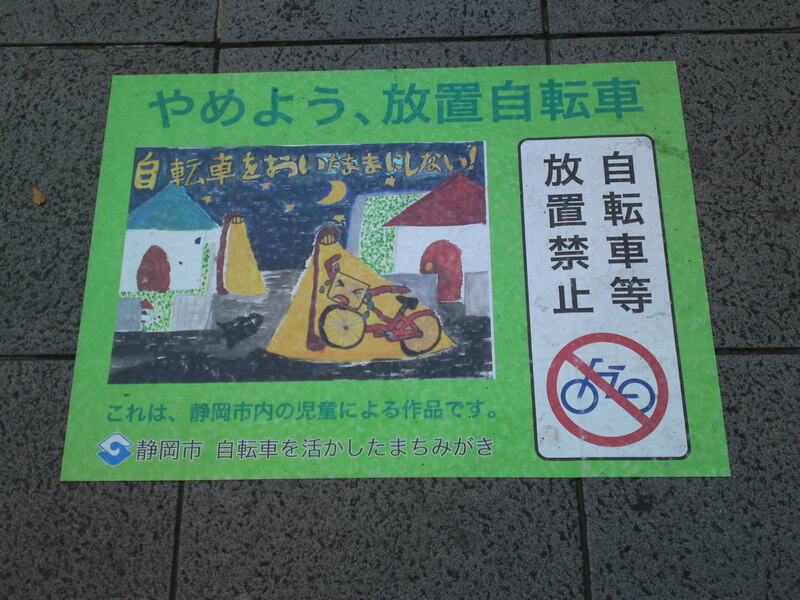 Interesting picture showing bicycles impeding with the yellow markings designed to help pedestrians with impaired eyesight!